Ahhh, Spring. 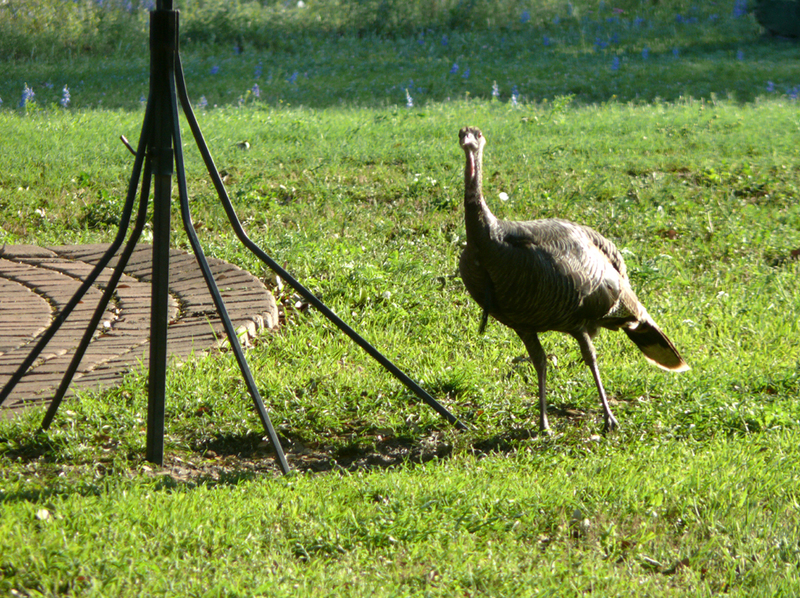 Along with the warm weather comes our menagerie of feathered friends. 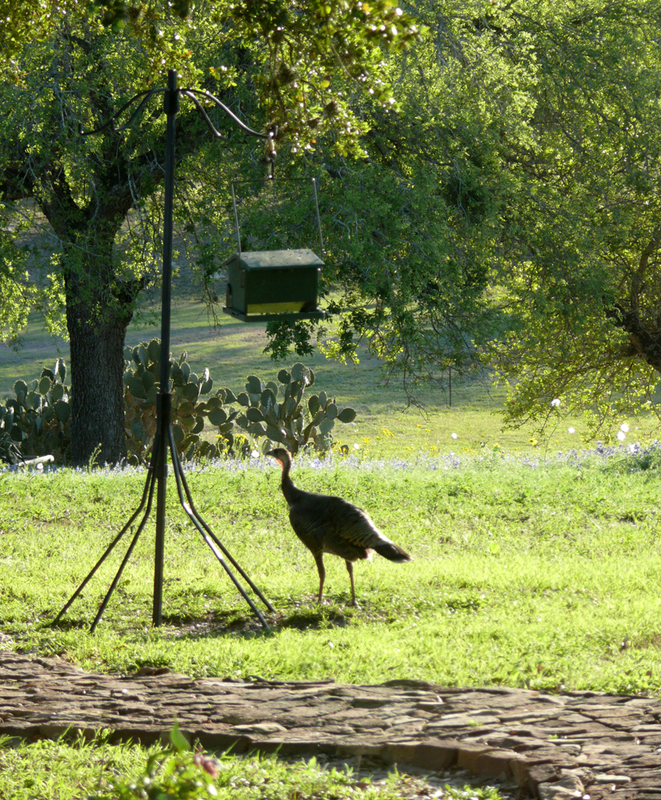 We so enjoy seeing the Wild Turkeys. This guy is a beauty, scarfing down the sunflower seed that has fallen from the feeder above. 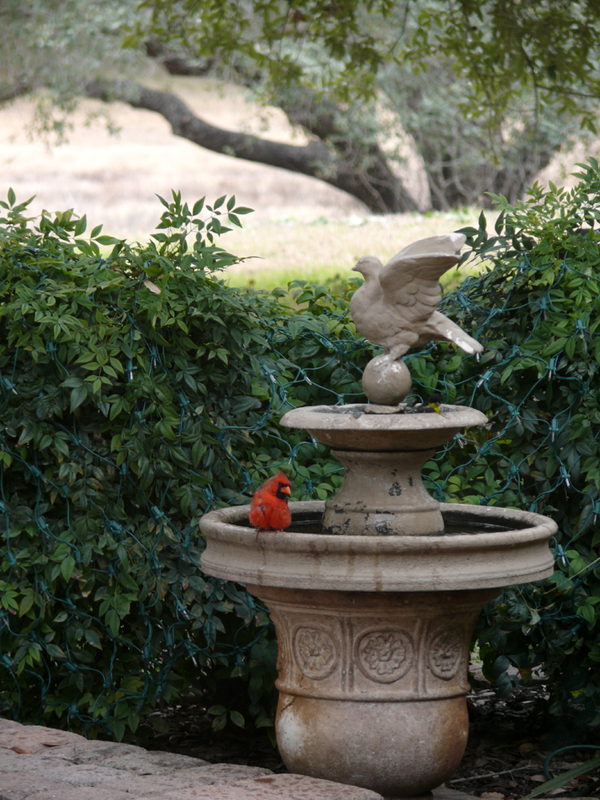 Mr. Chippers, our resident Northern Cardinal, is taking his spring bath. Actually he bathes almost every day, we think Mrs. Chippers makes him! 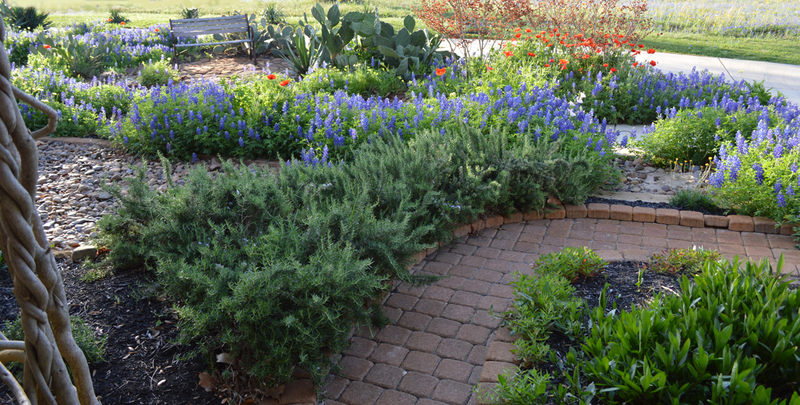 Bluebonnets and Red Corn Poppies fill our beds. I always let them go to seed after they flower, that way they come back naturally every year. It’s fun, I’m never sure where the crimson Poppies will POP up! You can click on any of the images to see them larger. 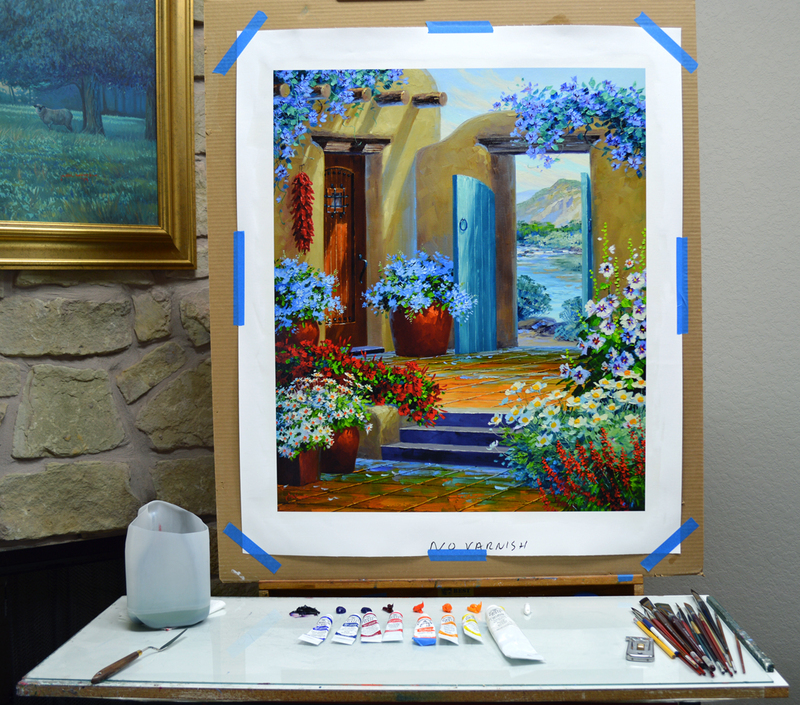 Back to the easel! I’m working on a commission of a piece very similar to one I’ve done previously. Bonnie fell in love with the painting but just missed winning it on eBay. So… we’re collaborating on a special version just for her. Just like building a house the basic structure of the door and steps is sketched in first. Next I begin drawing her kitty, Buddy, by the terra-cotta container. While most of the United States is still dealing with freezing cold spring has arrived here in South Texas. 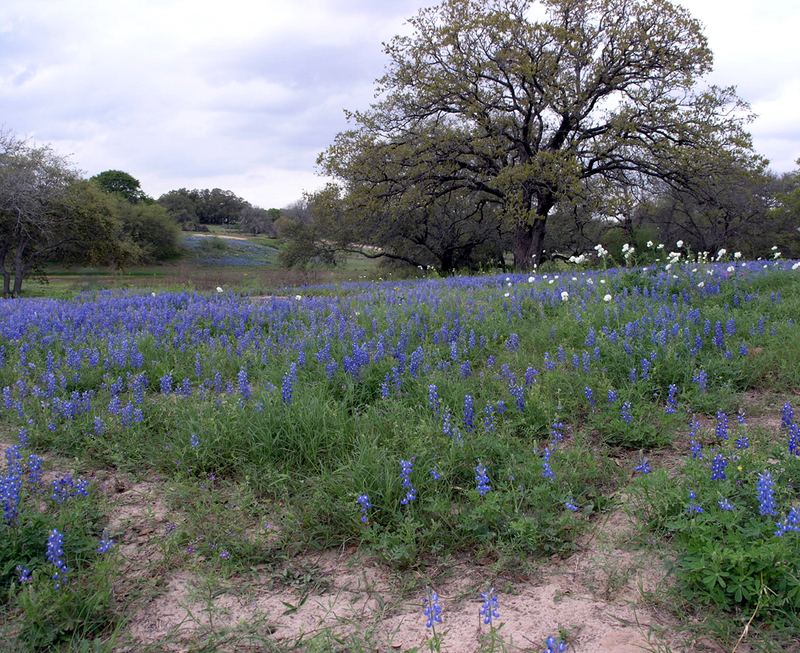 We know winter has disappeared for another year when Bluebonnets cover the countryside. 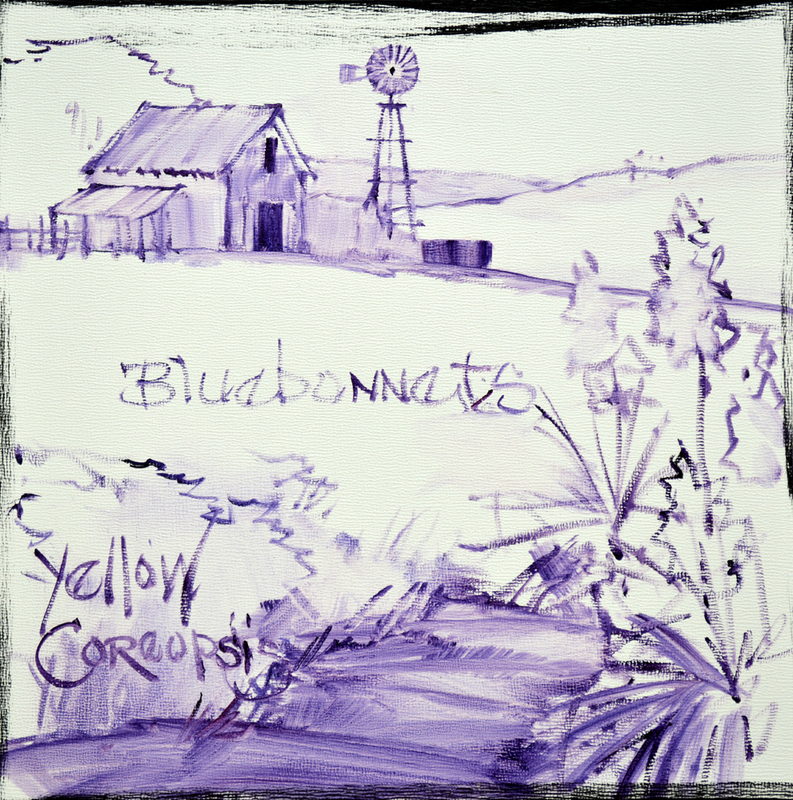 So let’s capture those beautiful state flowers on canvas for my eBay auction piece. My first step is to sketch up my basic plan on the panel in a thin oil wash. If you would like to go directly to eBay CLICK HERE. Don’t linger, the auction ends Saturday, March 29 at 8PM Central Time. Don’t you love old, red barns? Jack and I took pictures of this barn years ago, it’s still one of my favorites. The faded red is mixed from various combinations of Alizarin Crimson + MUD (Ultramarine Blue + Alizarin Crimson) and a little White. You can click on this or any of the other pictures to see them larger. And we just have to have a windmill! It is drawn into the wet paint of the sky with a thin mix of MUD. My wrist is braced on my mahl stick to steady my hand as I delineate the individual blades. 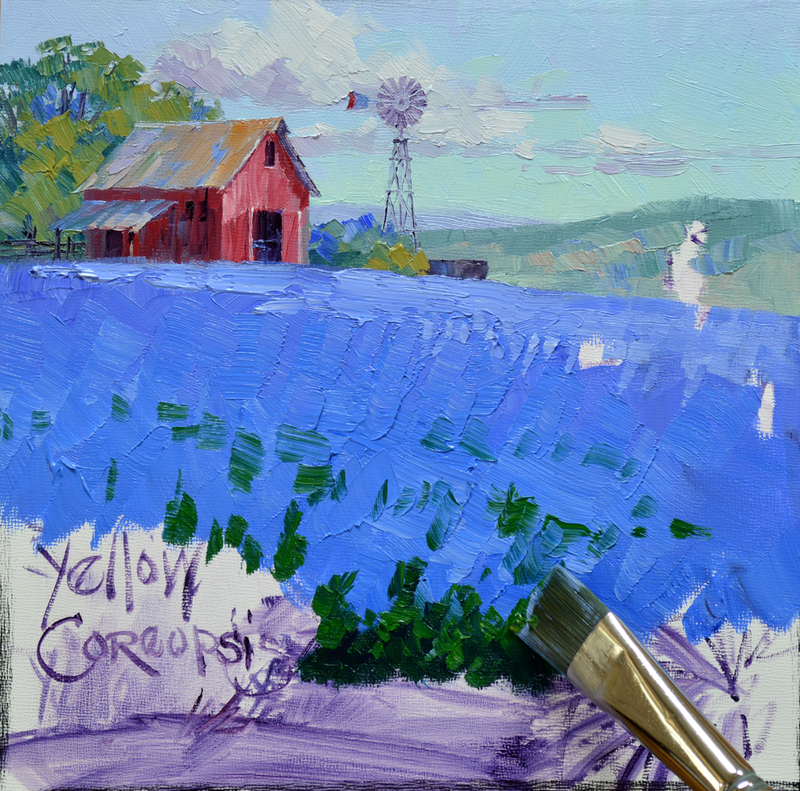 The entire blue area of the Bluebonnet field is painted first. 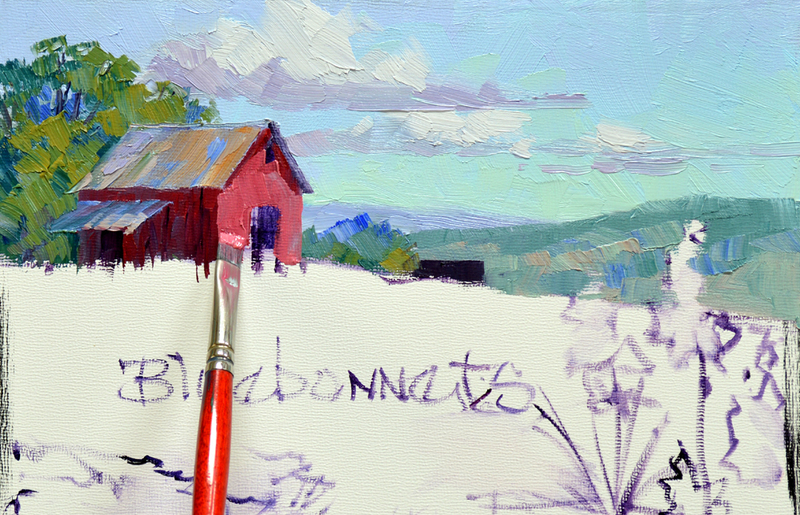 I’ve used a muted blue mixed of Ultramarine Blue + a little MUD near the barn. 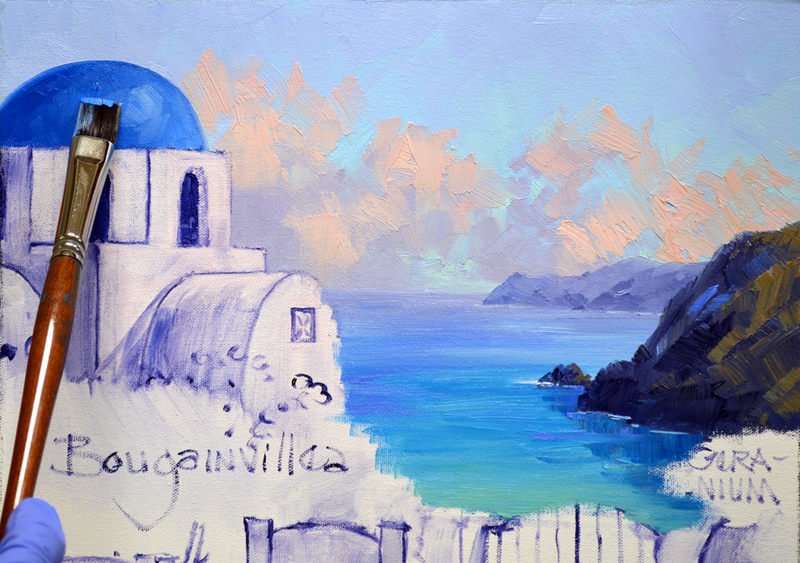 Pure Ultramarine Blue + White makes up the middle ground while the more intense blue in the front is Cobalt Blue + White. This gradation helps to give the feeling of depth. 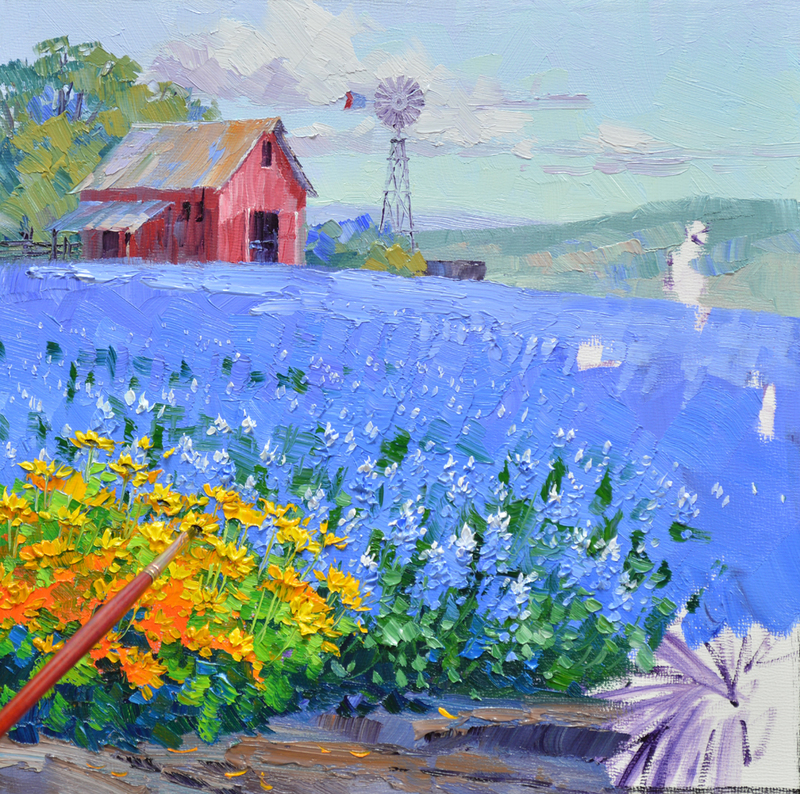 Next I come back and begin adding the foliage of the Bluebonnet plants. Now the individual flowers are developed. 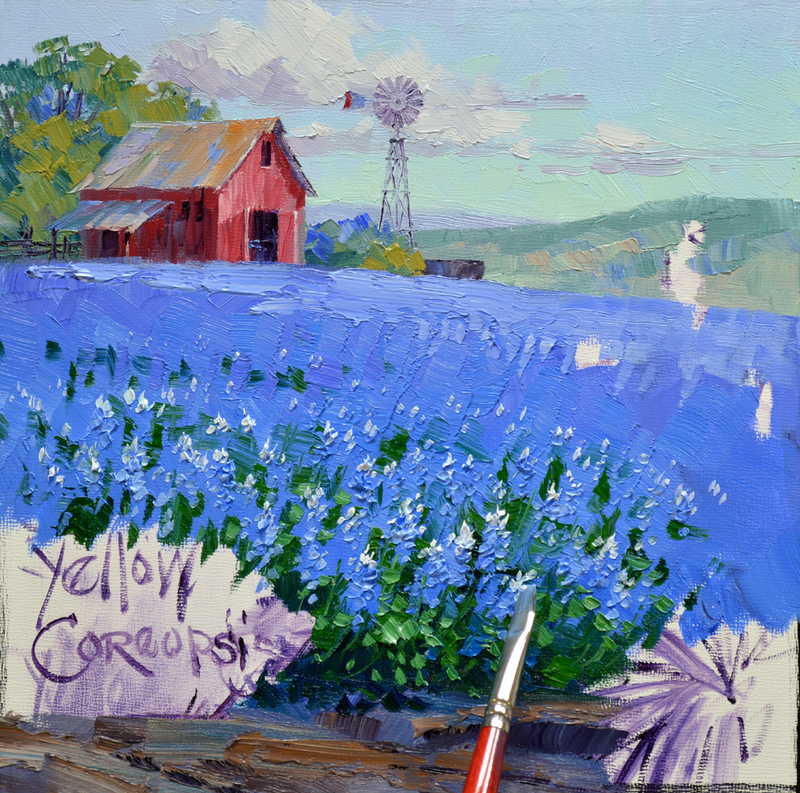 The final touch on the Bluebonnets is to add the White tops. 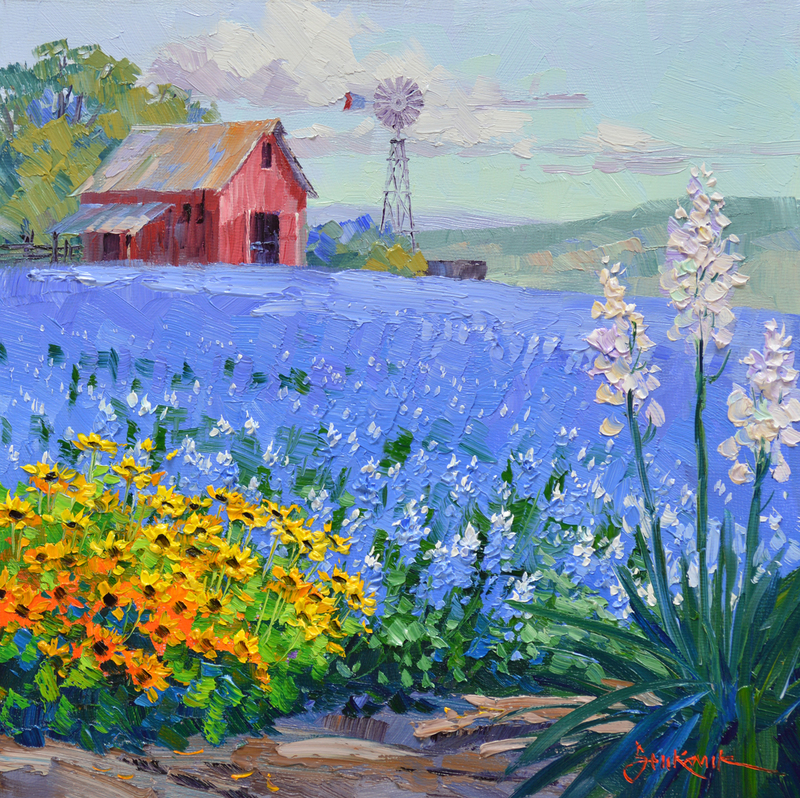 Coreopsis, dancing in the breeze, bring a blast of Bright Cadmium Yellow to the foreground. Here’s your opportunity to enjoy the delight of a warm, Texas spring day all year long in your home or office. To visit ALL my auctions on eBay CLICK HERE. 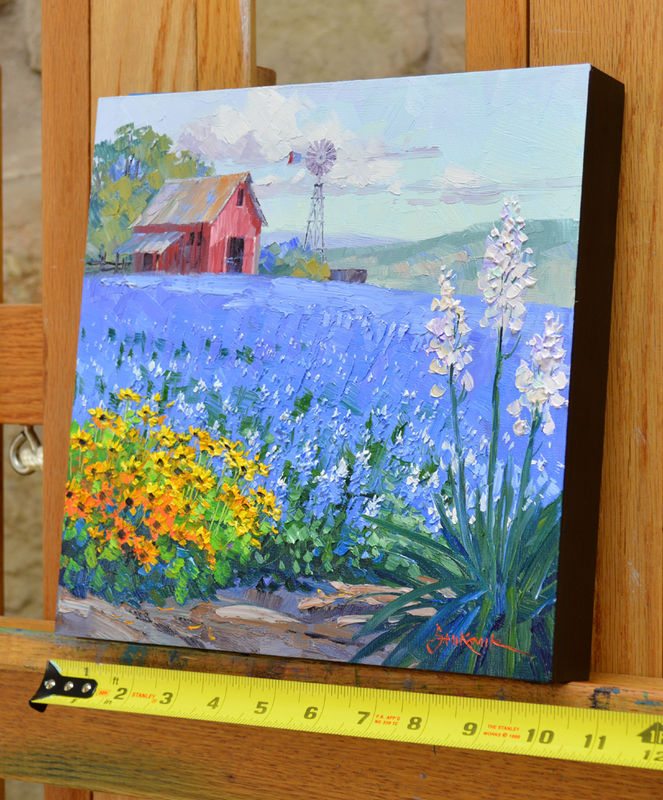 Blanketed with Bluebonnets measures 10″ x 10″ and would retail in our galleries for $490. But to make it more fun we are starting the bidding on the auction at 1 cent. That’s right, ONLY A PENNY! But you’ll need to act quickly, the auction ends Saturday, March 29 at 8 PM Central Time! 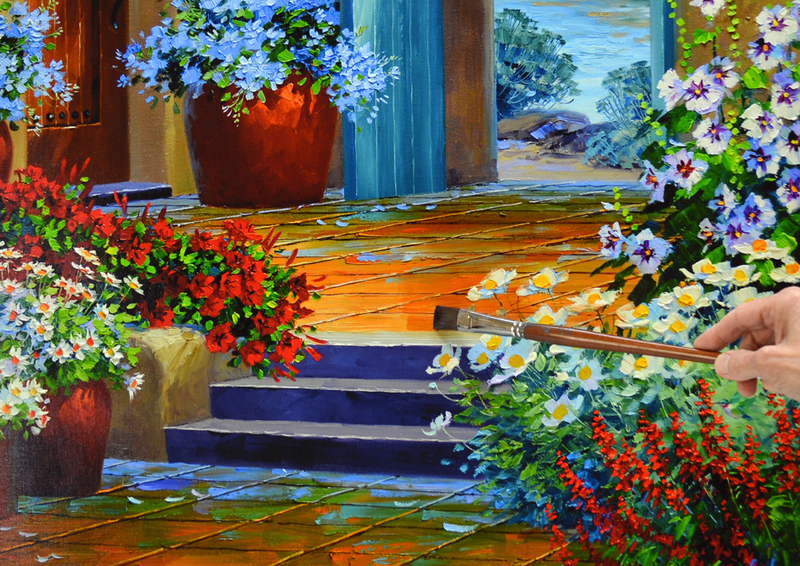 And don’t worry about framing this spring landscape, it is painted on a panel with 1 1/2″ finished sides. You can take the EMBRYO out of the box and hang it directly on your wall. We even provide the hanger and nail! CLICK HERE to go directly to the auction. 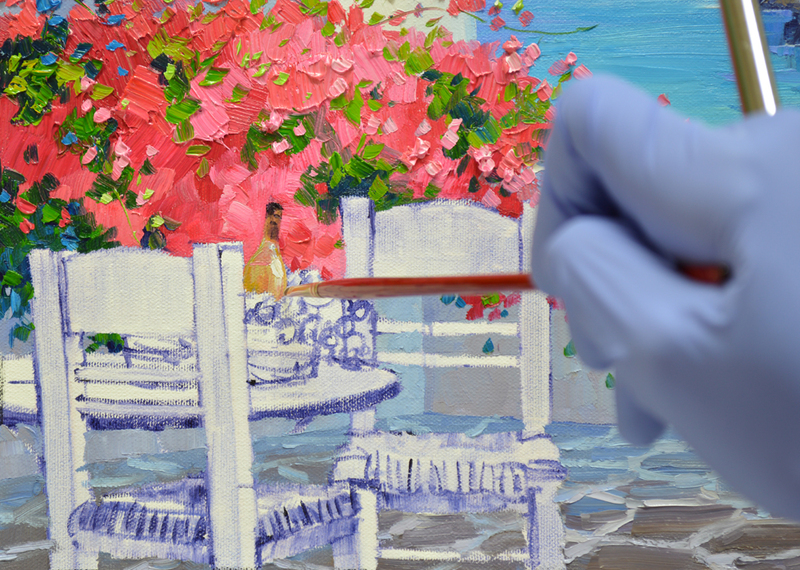 We’re changing the red Petunias to Bougainvillea HOT PINK! Permanent Rose + White mixed in different combinations makes the perfect color for these fragrant flowers. Don’t forget, you can enlarge the pictures by clicking on the image. Embellishing the White Hollyhocks is fun. 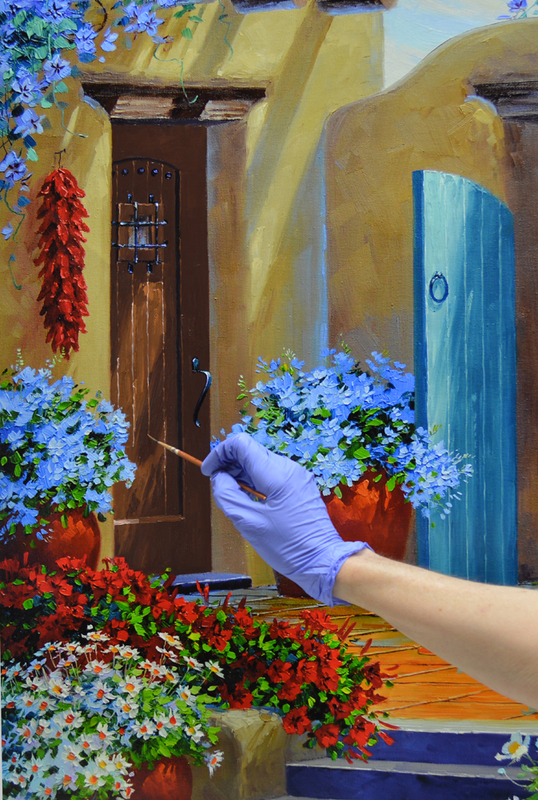 I go back in and repaint the shadows of the blossoms with mixes of Ultramarine Blue + White, Pthalo Blue + White and Dioxazine Purple + White. Then the pure White highlights are delineated with thickly textured brushstrokes. 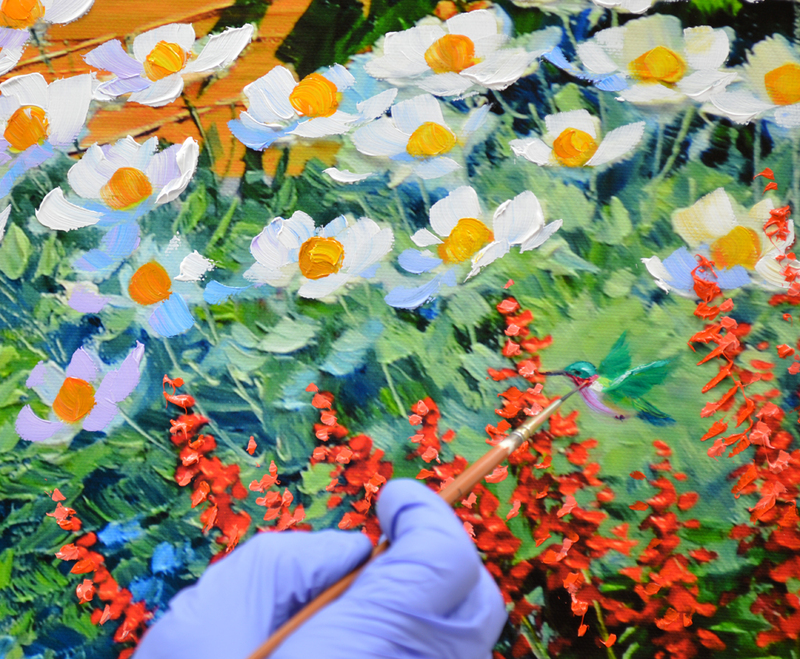 After repainting the petals of the Matilija Poppies the deep yellow centers are added. These are sometimes called “Fried Egg Flowers”. Can you see why? Now the White Daisies are enhanced. The basic giclee print is a little bit blue, this makes the pure White highlights POP! 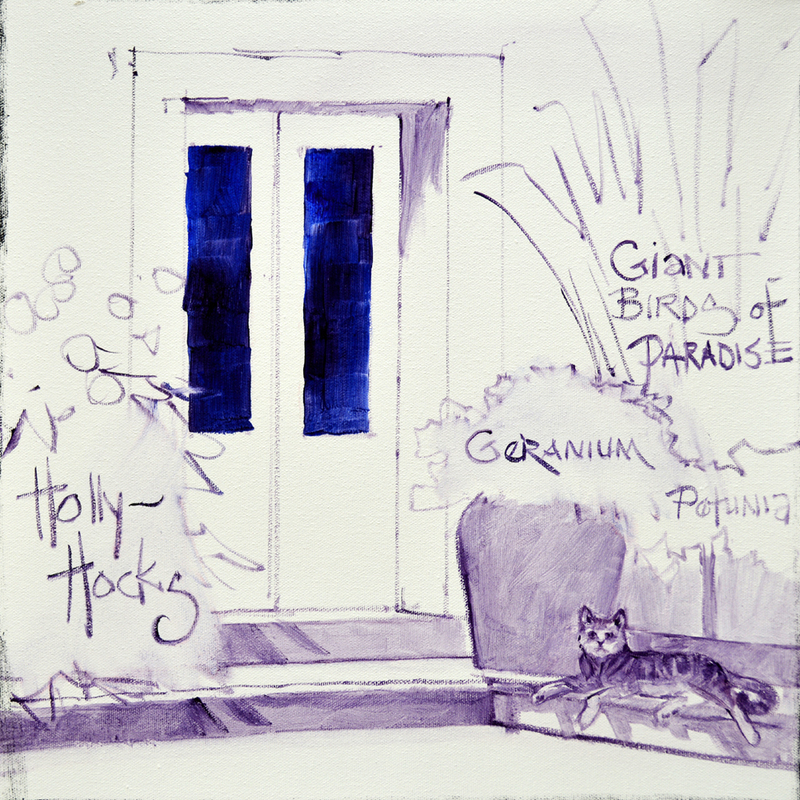 I save the star of the show, our perky little Hummingbird, ’til last! Rhett dances and flits around the Cadmium Red Light Penstemon. 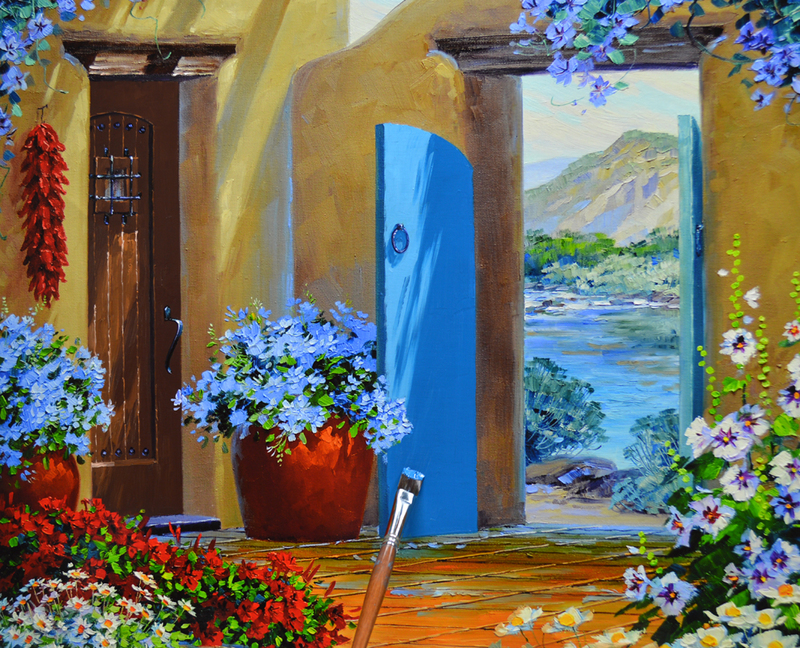 Today we’ll embellish a Limited Original, a digital reproduction of my original oil painting Hummingbird Hideaway. 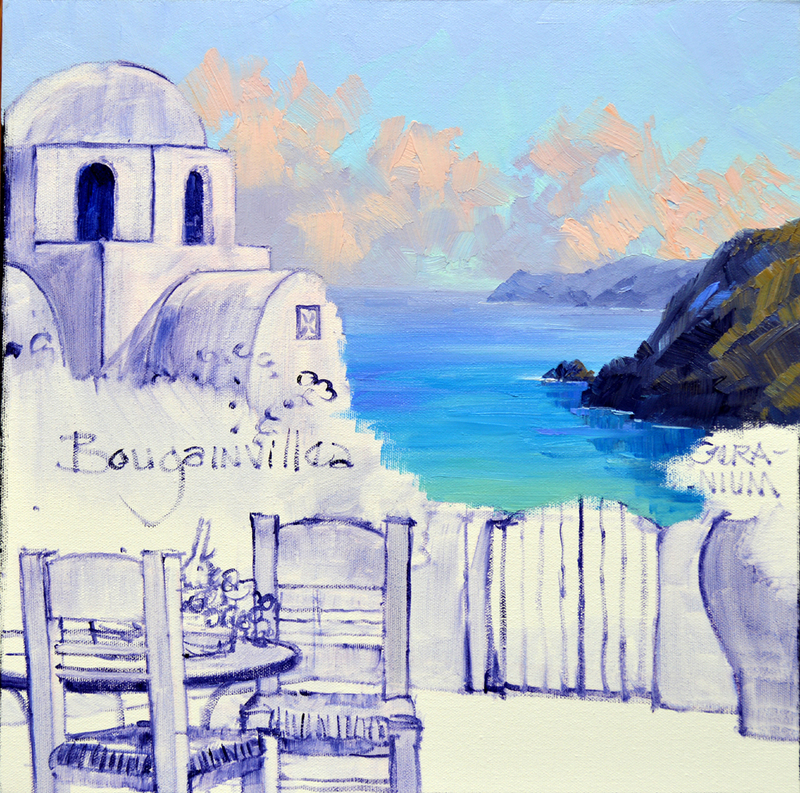 The giclee on canvas is taped to a large piece of double ply cardboard. Notice the note from our printer, Miguel, at the bottom “No Varnish.” He did this to remind me he didn’t apply any UV varnish to the giclee. 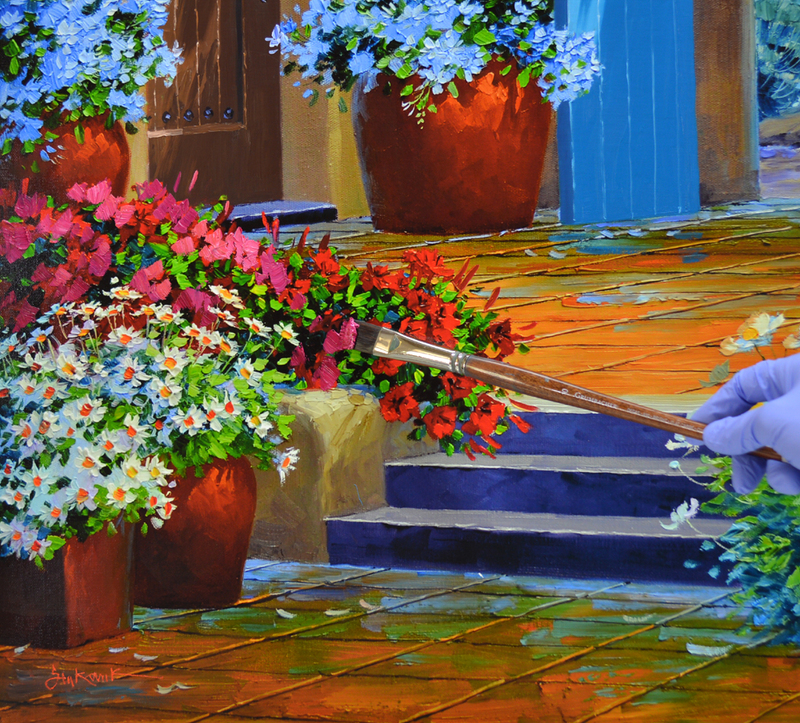 So before the piece was set my easel I covered the entire giclee with two thin coats of the UV varnish. This protects the piece from fading, adding to its longevity. If you would like to view this or any of the other pictures larger just click on the image. 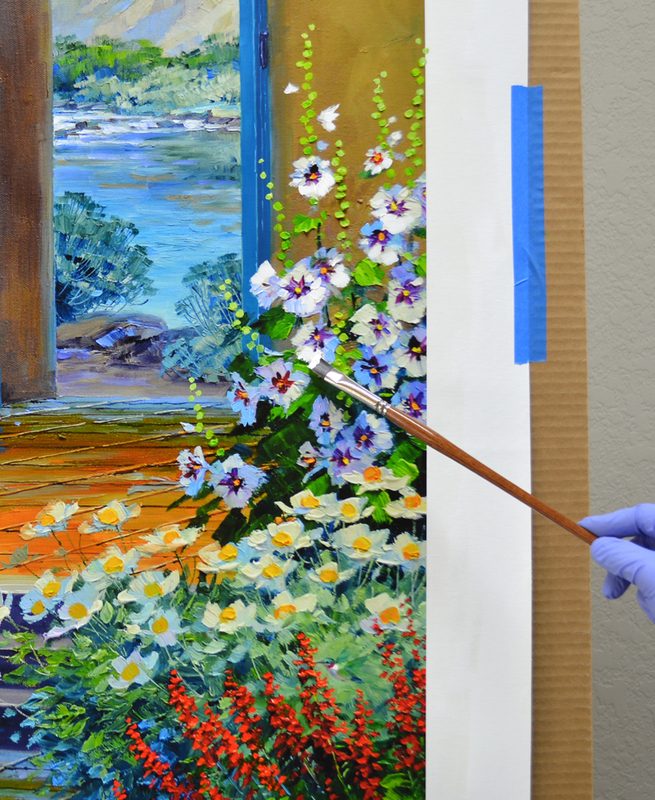 I use Winsor Newton GRIFFIN ALKYD Oil Paints for the hand embellishing. 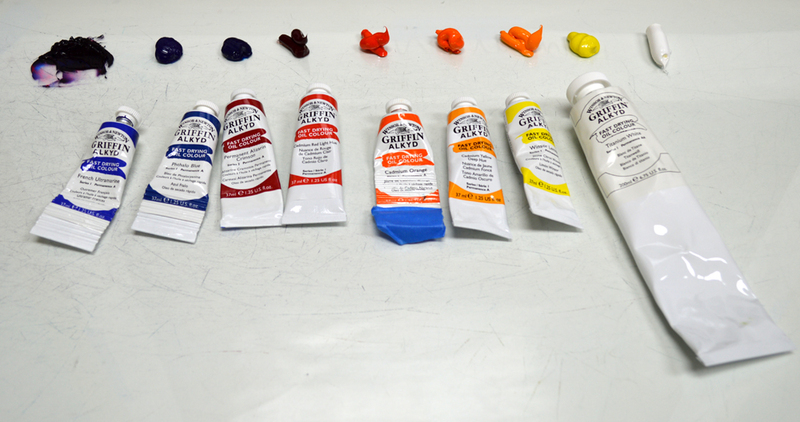 They come in the same colors and mix like regular oil paints, but dry MUCH, MUCH faster. This allows me to add a lot of texture to the piece and still have it completely dry in a couple of days. 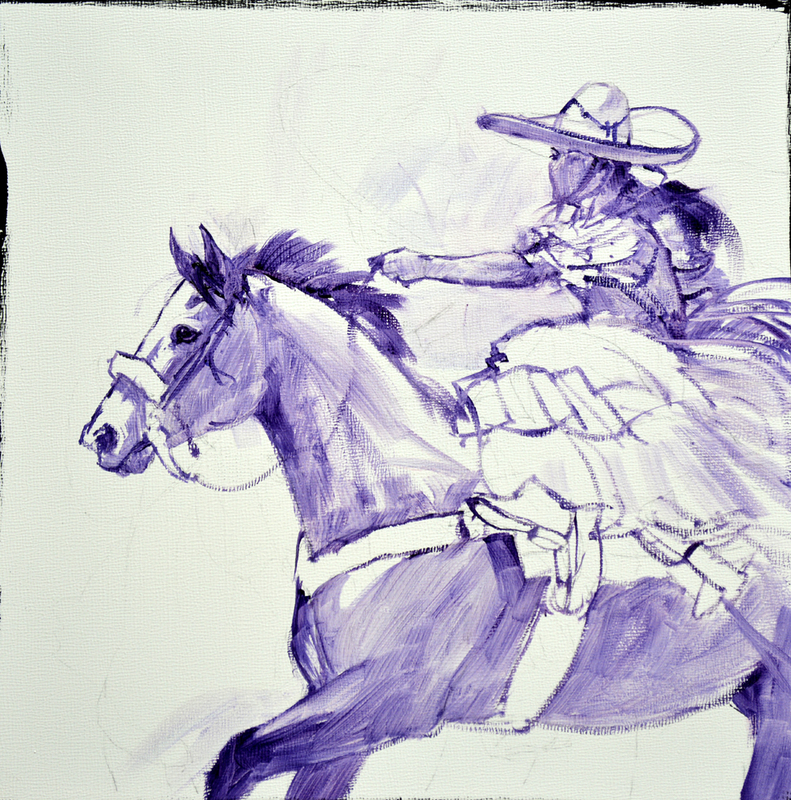 The first step is to glaze areas of the giclee that I want to be richer in color. I mix a little of the Alkyd Oil Paint with Liquin, an alkyd based dryer, to make a thin wash. #1. Burnt Sienna + Liquin. #2. Pthalo Blue + Liquin. #3. 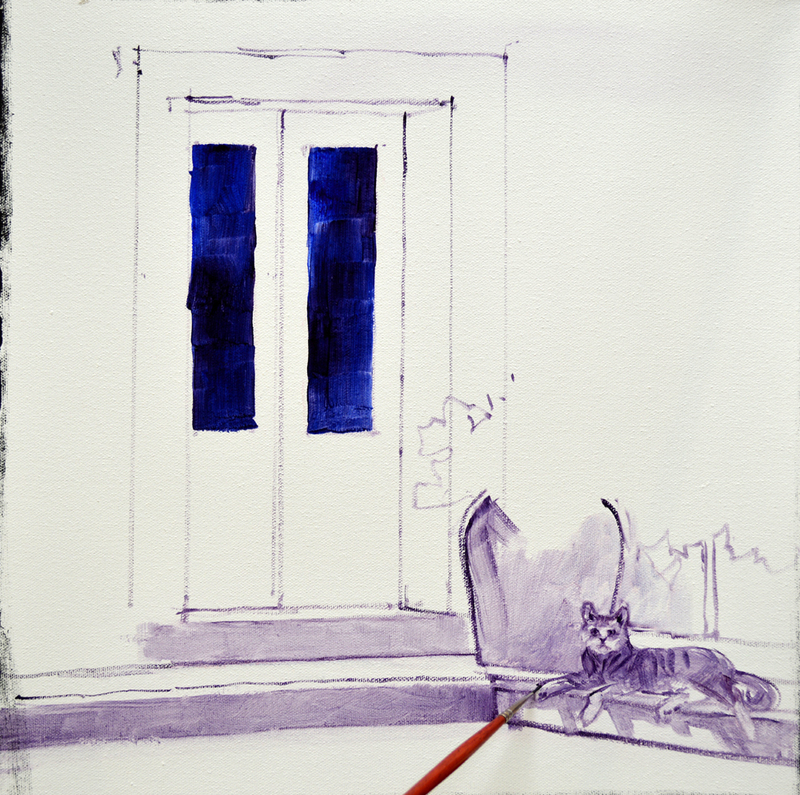 Ultramarine Blue + Liquin. The floor is glazed with mix #1. The area to the far left of the brush has not been covered, can you tell the difference? 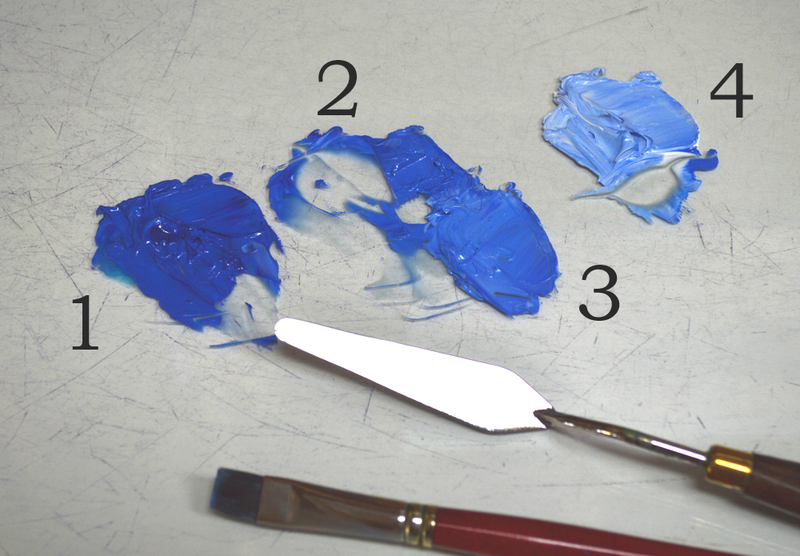 I’ll use mixtures #2 and #3 to make the color of the water in the background richer. Our collector, Nancy, has a dark wood front door. I repaint this one to match hers a bit more closely. We’re painting the gates to be similar to the upholstery on the chairs in Nancy’s living room. 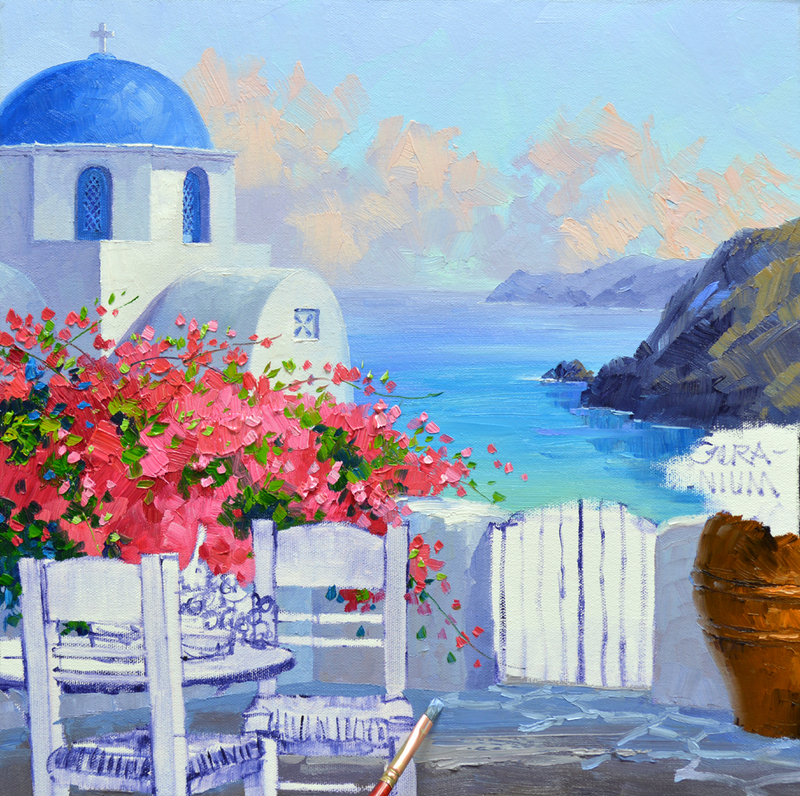 It’s fun working with collectors to make art that fits their individual environments. 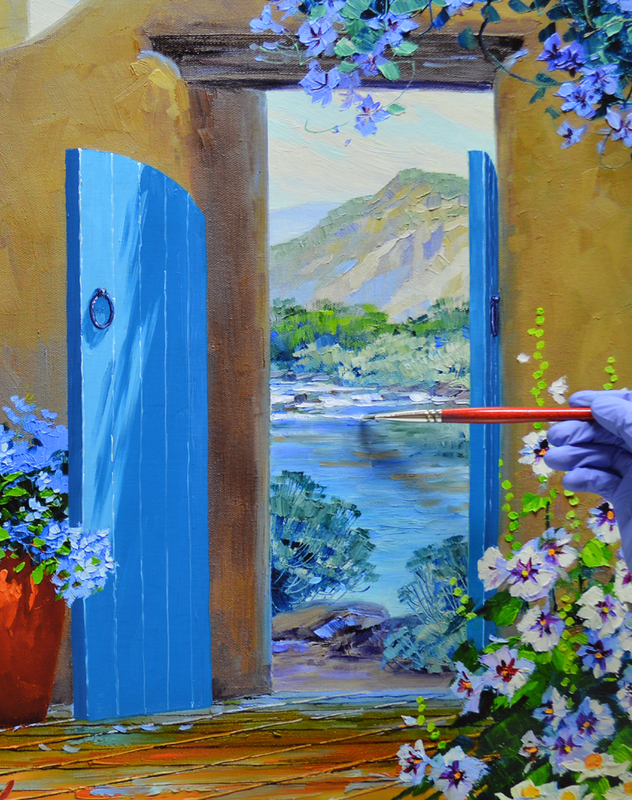 I’m using mixtures of Pthalo Turquoise Blue + a touch of Ultramarine Blue + White in varying combinations for the wooden gates. The white water of the rapids in the distance is highlighted with White + a tiny touch of Ultramarine Blue so it will drop back. 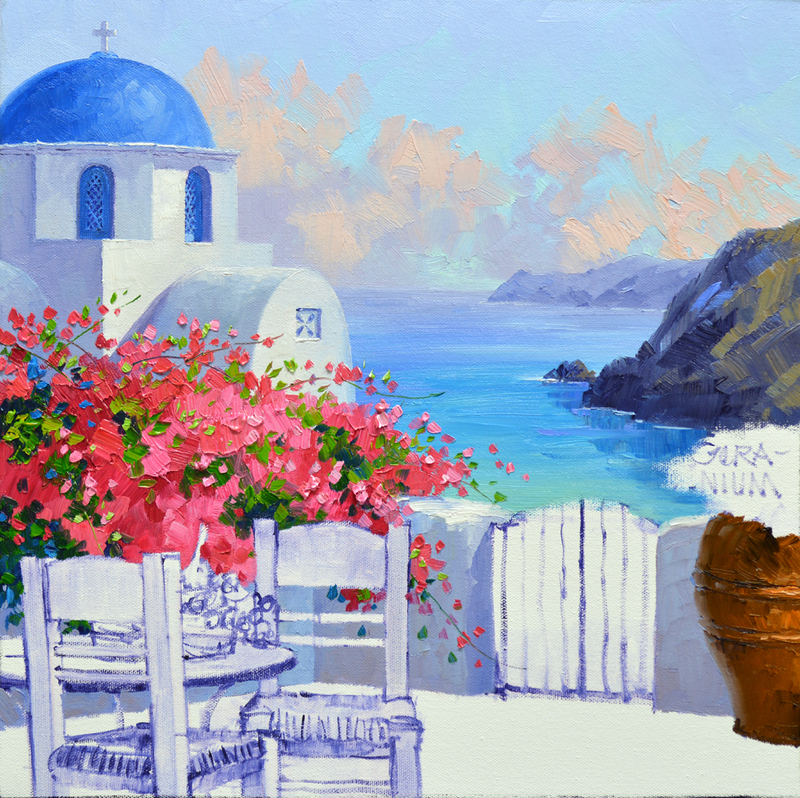 I don’t use pure White here, that will be saved for the flowers in the foreground. Spring has sprung in South Texas, that means Fiesta is right around the corner. One of the neatest events is the Mexican Rodeo. 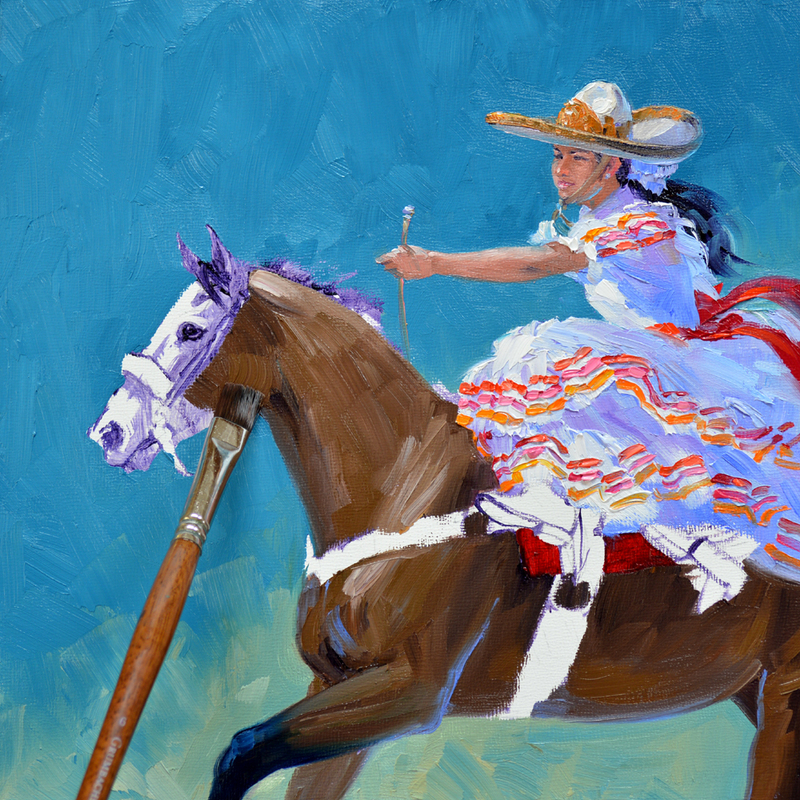 The La Escaramuza Charra is an equestrian competition performed at a full gallop by girls wearing beautiful, flowing dresses. 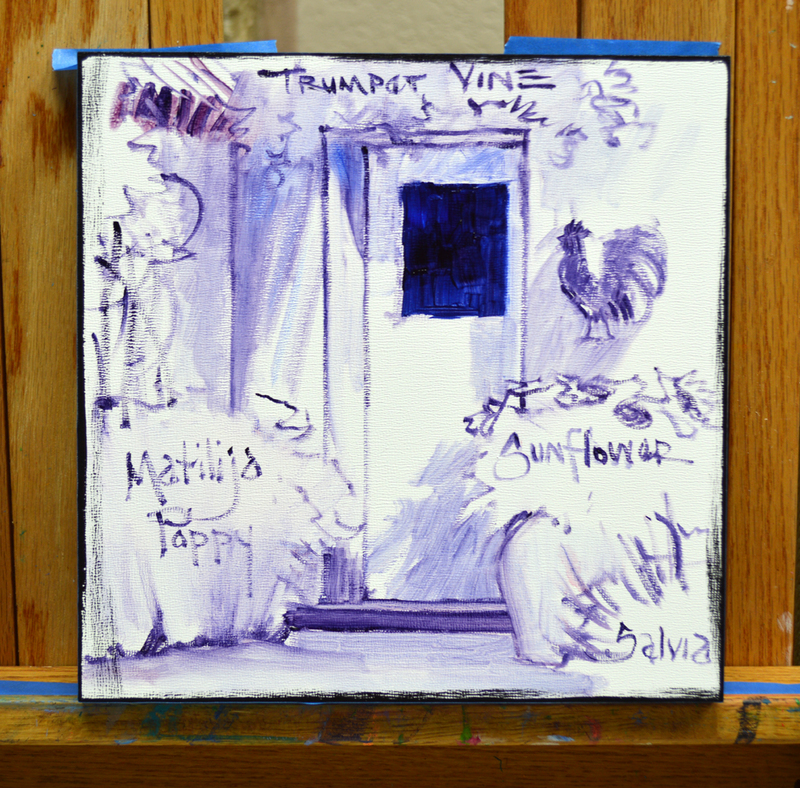 The initial plan for my eBay painting this week is sketched up on the canvas in an oil wash of MUD (Alizarin Crimson + Ultramarine Blue) + Liquin. 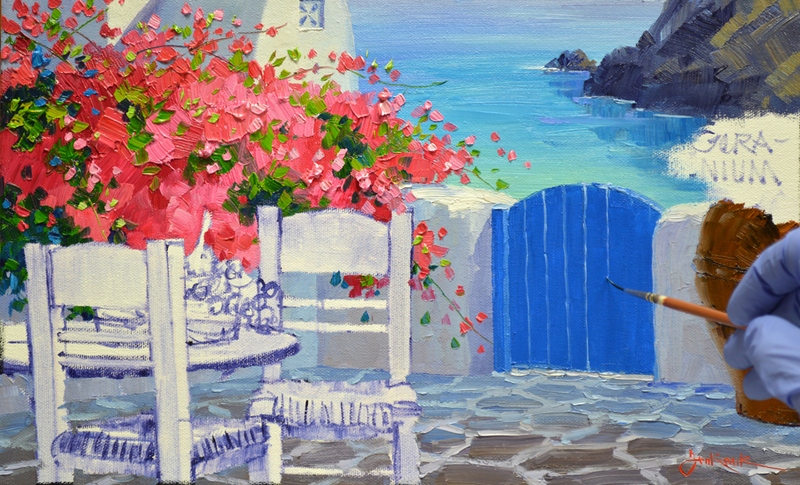 The background is a mix of Pthalo Blue + Cadmium Orange + White. 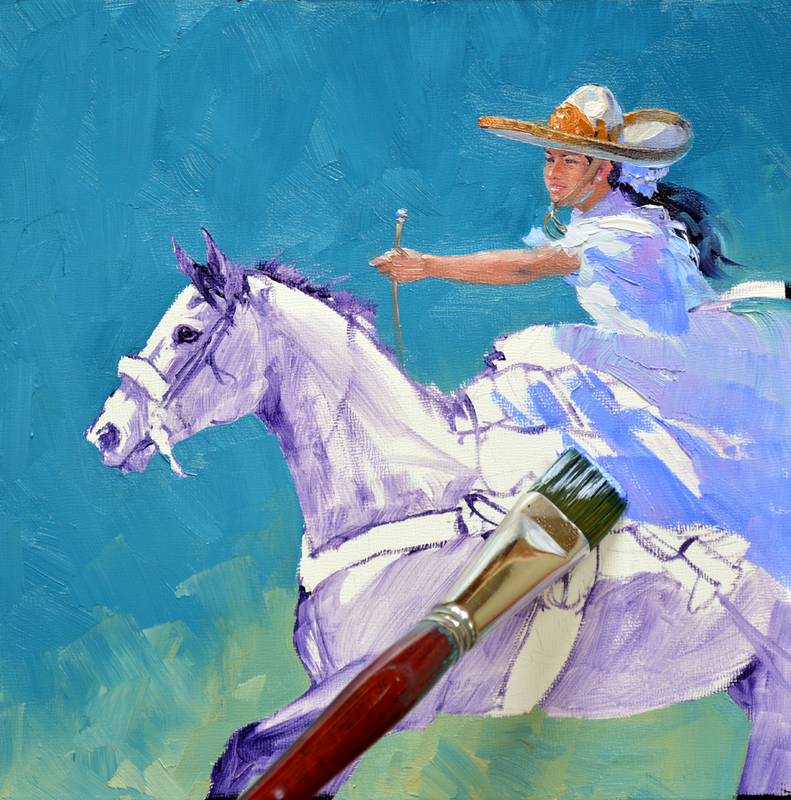 I want the upper part to be dark, accentuating the white dress of the rider. The lower “dusty” portion of the background is made of the same combination of colors in different proportions. While I’m fresh I work on the Charra’s face. A special color, Terra Rosa, is used for her skin tones. 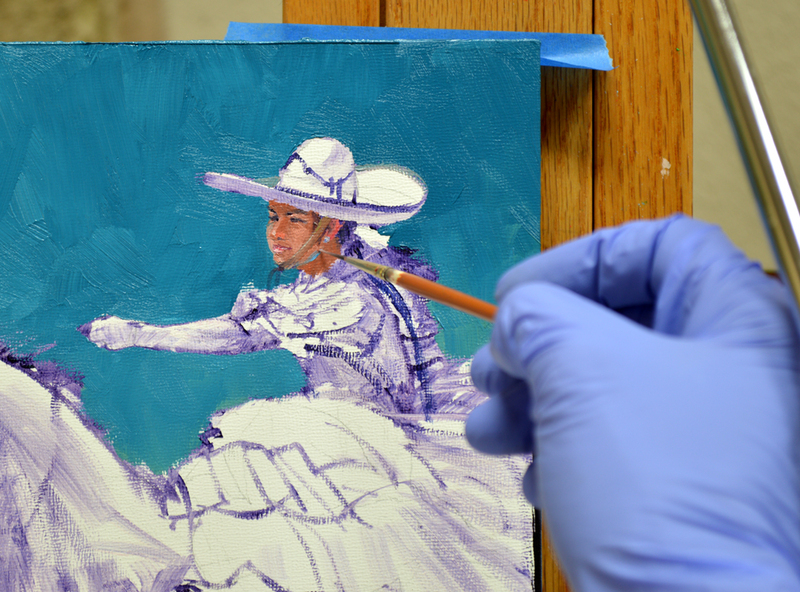 A little Cerulean Blue is added to the mix to make the reflected light along her jaw line. To see this, or any of the other pictures larger just click on the image. 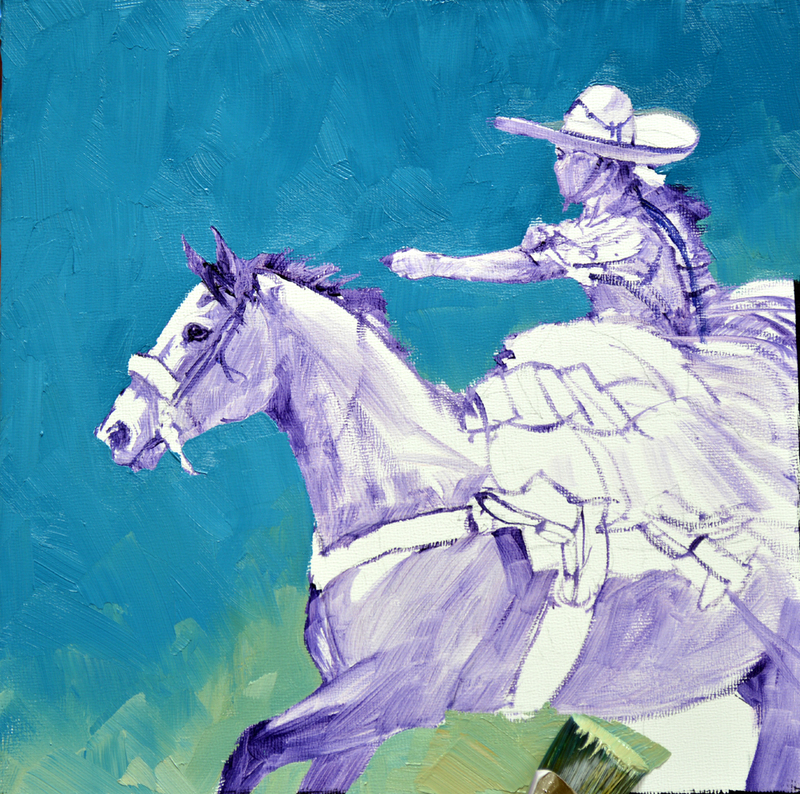 The shadows of the white dress are blocked in with mixtures of Ultramarine Blue + White, Dioxazine Purple + White and Pthalo Blue + White. After adding the White highlights on the dress the ribbons are delineated. 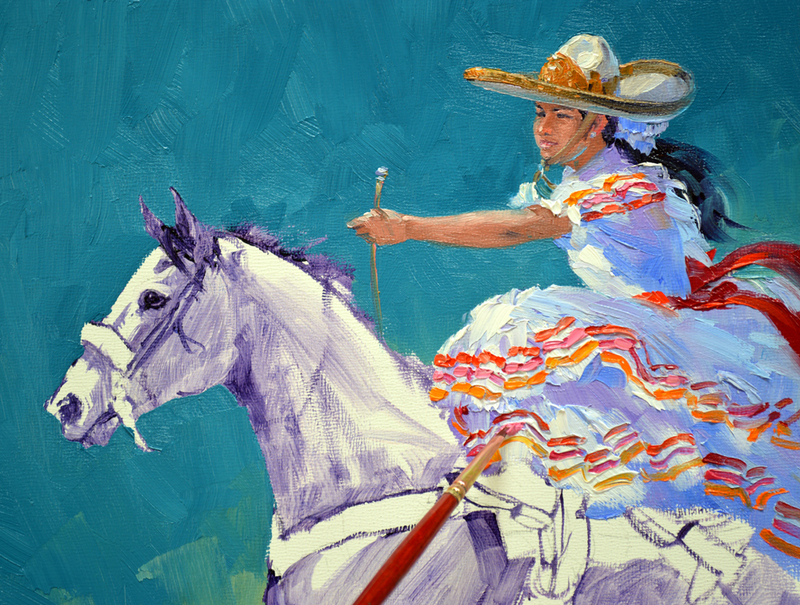 If you ever have the chance to attend a Charreada you’ll be on the edge of your seat, holding your breath, certain the young ladies on their spirited horses will collide at any second. Here’s your opportunity to enjoy the excitement of the Charras every day on your wall. Do you have a gift giving occasion in the near future? Senkarik Original Embyros make unique presents that are sure to please, bringing smiles for years to come. 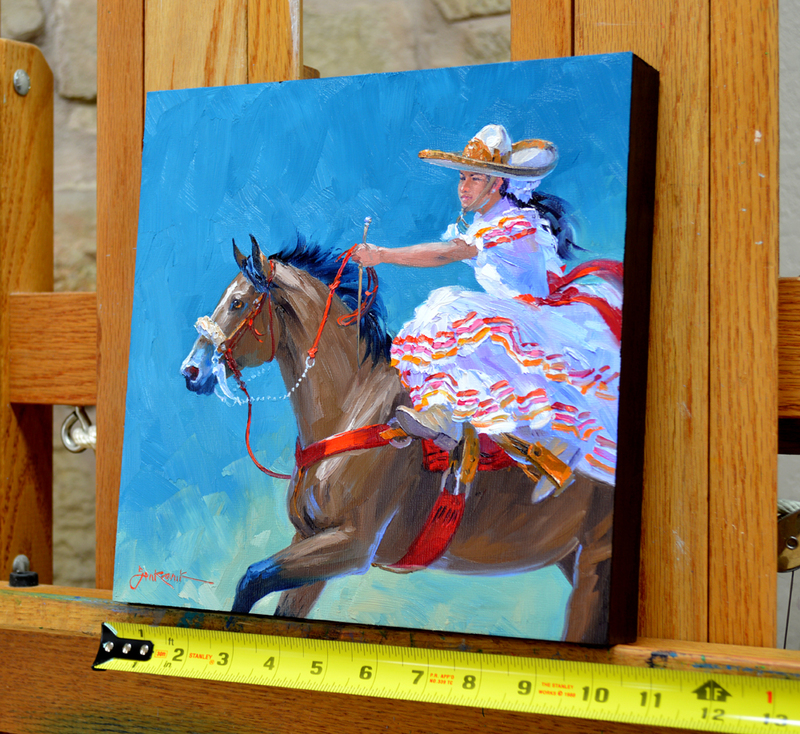 La Fiesta measures 10″ x 10″ and would retail in our galleries for $490. But to make it more fun we are starting the bidding on the auction at 1 cent. That’s right, ONLY A PENNY! But you’ll need to act quickly, the auction ends Sunday, March 23 at 8 PM Central Time! 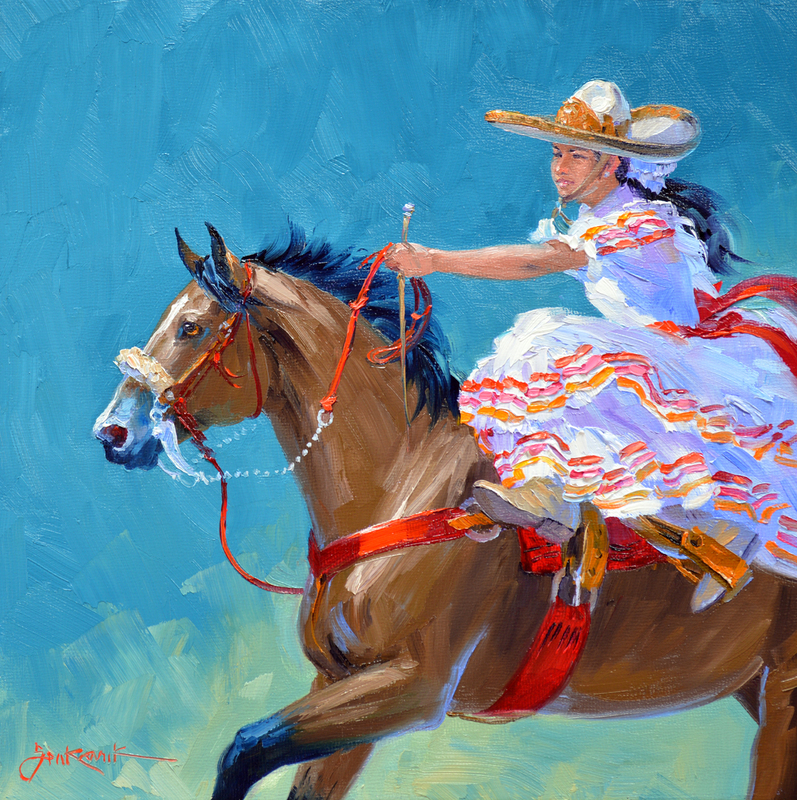 And don’t worry about framing this spirited Charra, she is painted on a panel with 1 1/2″ finished sides. You can take the EMBRYO out of the box and hang it directly on your wall. We even provide the hanger and nail! Let’s get to work painting those sunny yellow chairs. I’ve mixed my colors and we’re ready to begin. #1. Pure Cadmium Yellow Medium. #2. 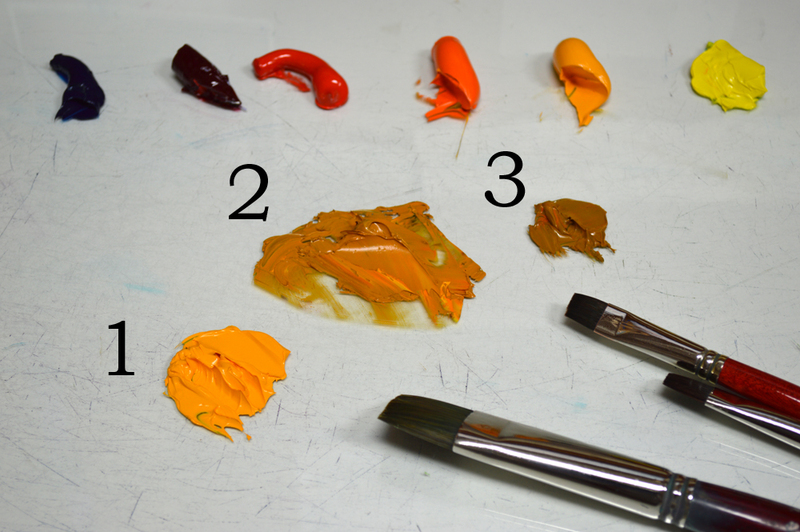 Cadmium Yellow Medium + Cadmium Orange + MUD (Ultramarine Blue + Alizarin Crimson). #3. Mix #2 + a little more MUD. Most of the chair behind the table is blocked in with Mix #2. Highlights where the sun hits the sides and top of the back are made with Mix #1 that has a little White added. The right edge of the upper back is darkened with a little of mixture #3. I brace my wrist on the mahl stick to steady my hand as I delineate the details of the chair. The cane seats are made with some of the paint leftover from the distant bluffs. The entire seat area is covered first with a medium value, then highlights where it’s illuminated by the sunlight are made. The final step is to make the dark indentations between the individual stands of cane. 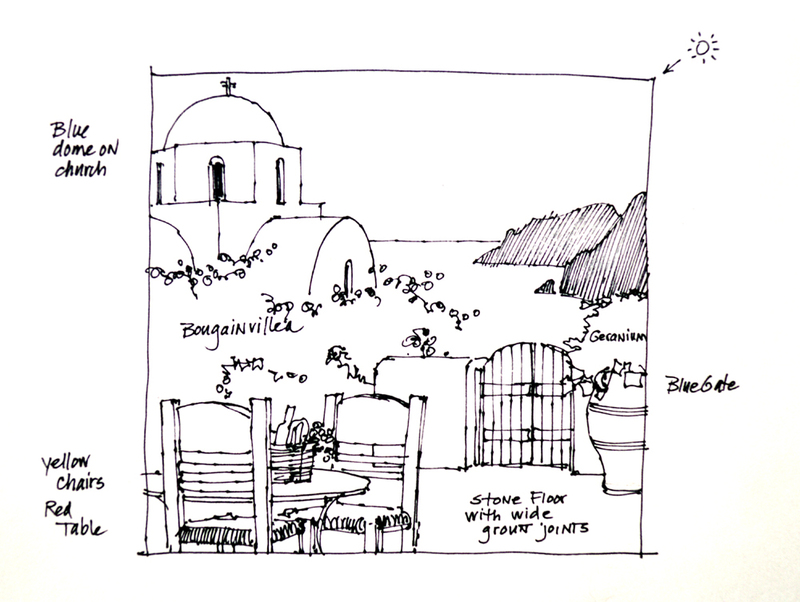 One of the coolest things in the Greek Islands are the stone floors with wide grout joints. 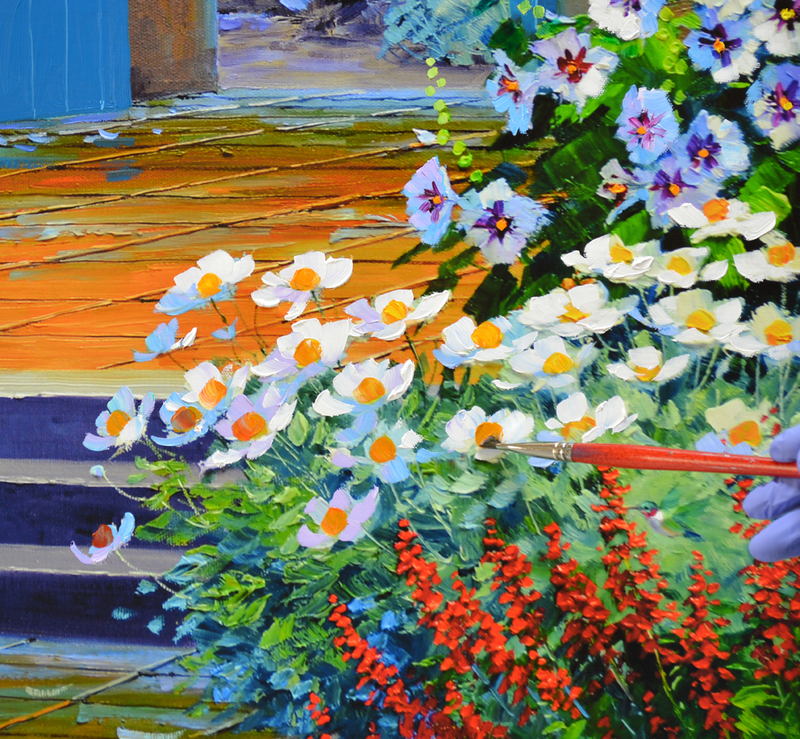 The entire surface of this delightful terrace is painted with warm and cool Grays made of varying combinations of MUD + Ultramarine Blue + Cadmium Orange + White. The bluer mixes are used at the back of the terrace, the warmer ones at the front. 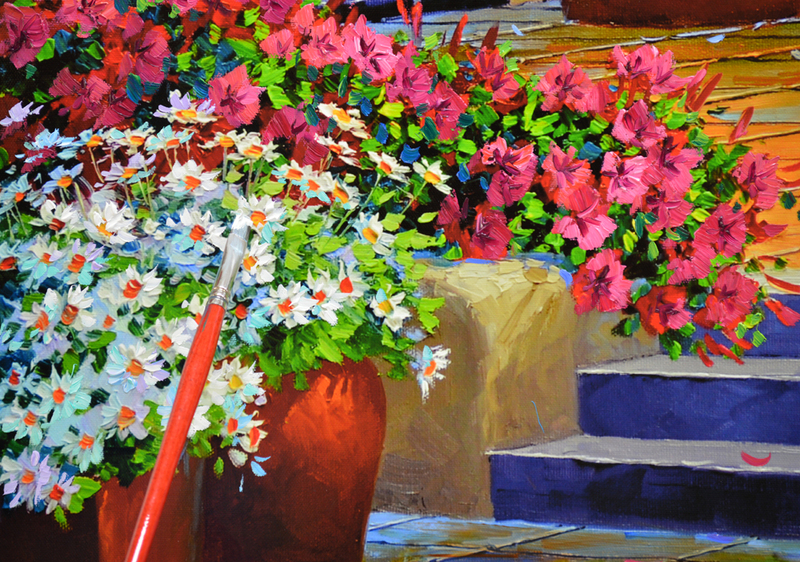 This follows a simple rule that helps give the feeling of dimension in a painting: Cool Colors Go Back, Warm Colors Come Forward. Next the grout lines are drawn into the wet paint of the floor using some of the wall color. The painting is signed when the floor is finished. It’s much easier to pull the smooth, delicate lines into the wet paint than it would be over lumps and bumps in a dry surface. 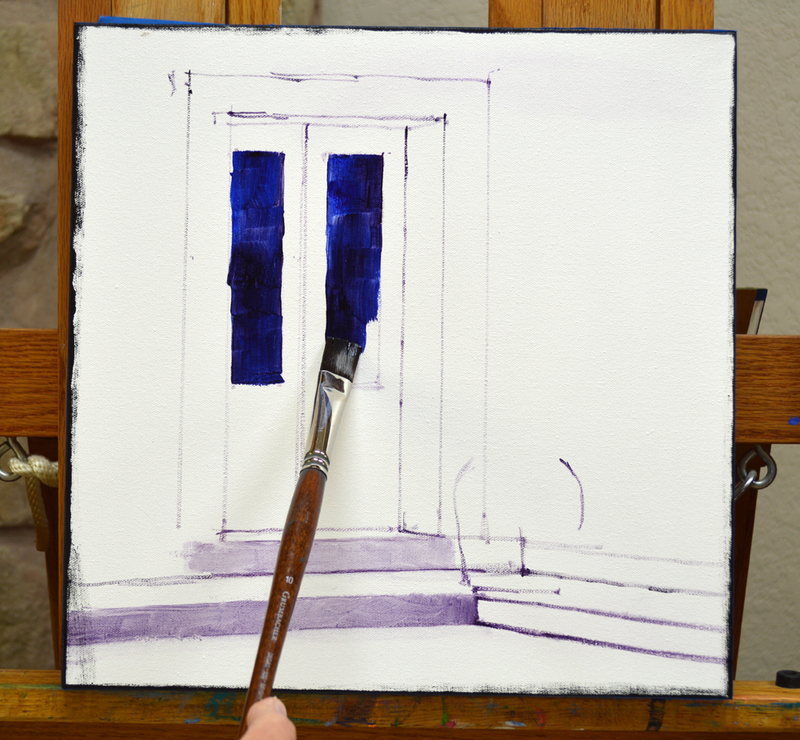 The gate is painted with the dark Cobalt Blue mixture left over from the Dome. 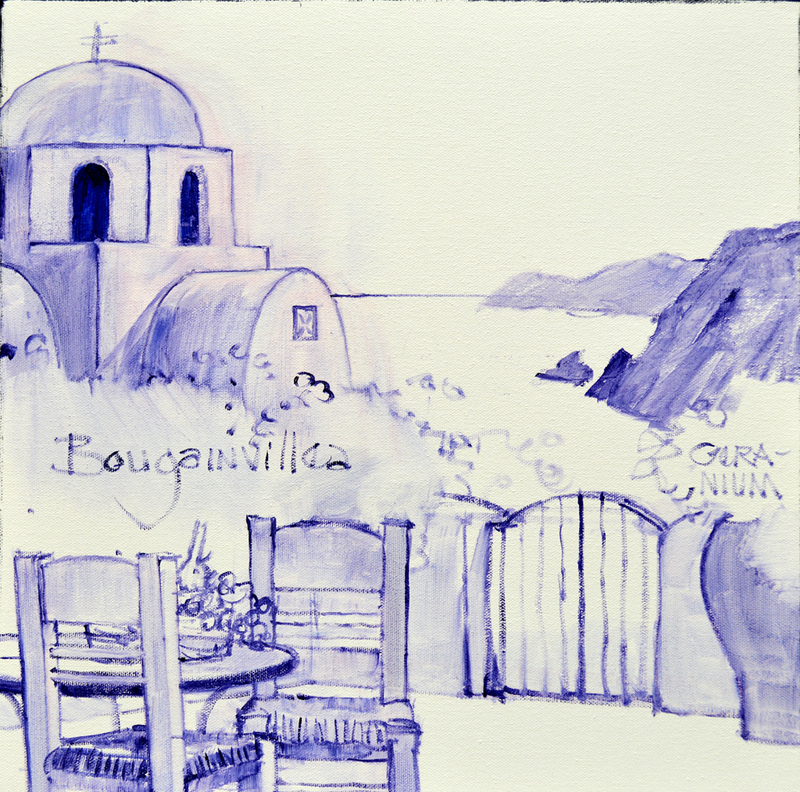 Retsina is a Greek white wine that has been made for at least 2000 years. The name for Retsina is derived from a Latin word, resina. The drink has it roots in early wine making practices. Lacking airtight containers for fermentation, many early white wines soured as a result of exposure to oxygen. To stave off this problem, wine makers covered their wine jugs in pine pitch, the same material used to waterproof boats. The pitch effectively sealed the containers so the wine did not spoil and consumers developed a taste for the resulting resinous wine. So let’s add a bottle in the basket on the table! A tall terra-cotta container filled with Geraniums accents the right side of the terrace. 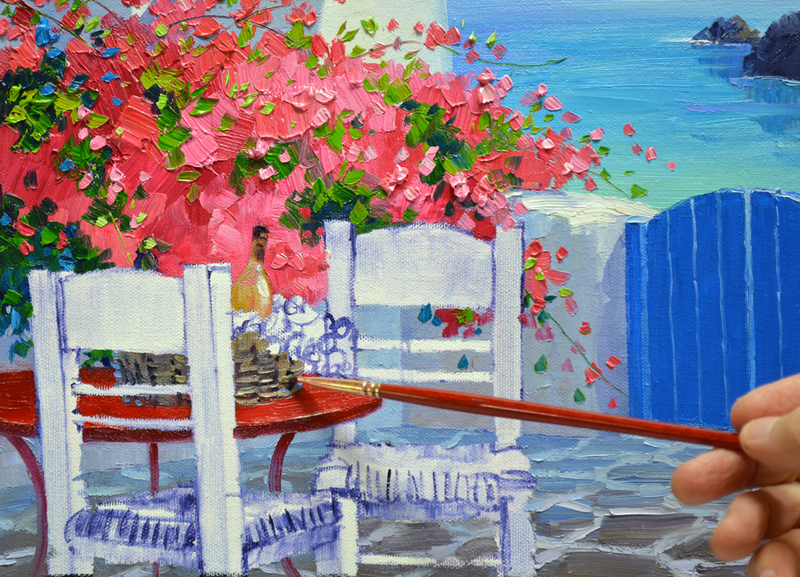 The Cadmium Red Deep table offers a nice compliment to the green grapes that will be in the basket along with the wine. 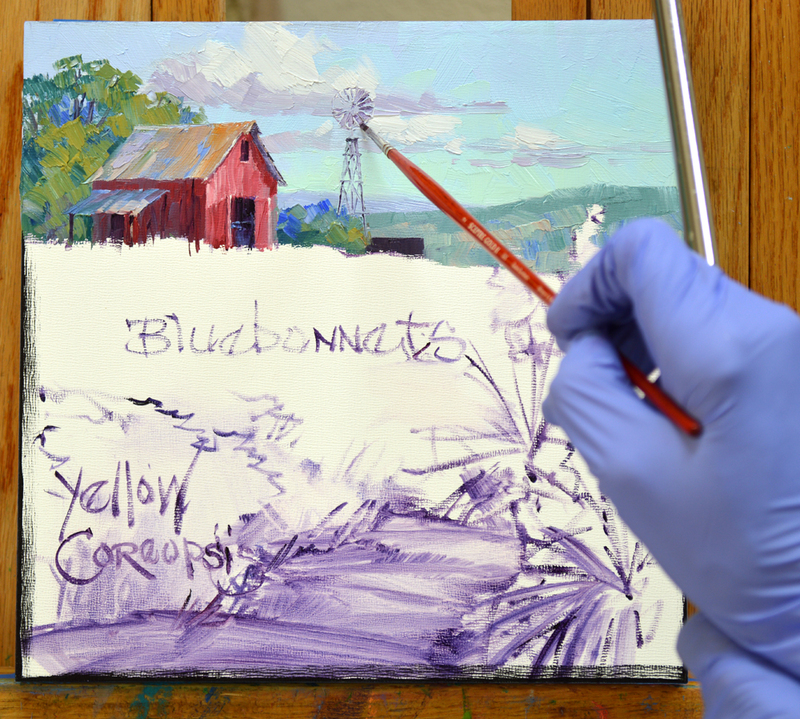 Today I’m using a special color not normally found on my palette, Cobalt Blue. 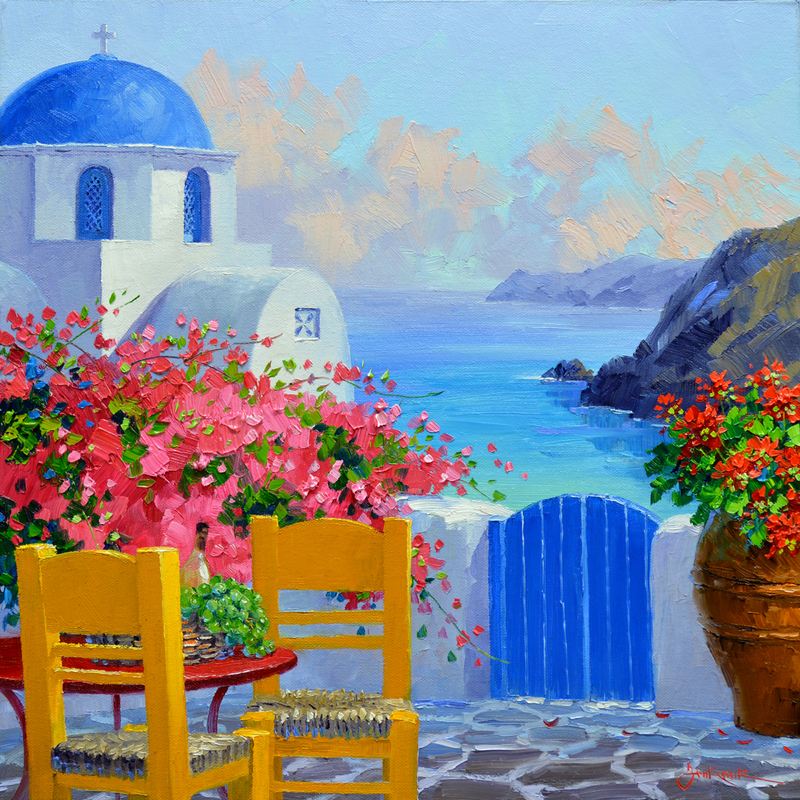 It is perfect for the domes, windows, doors and gates found in the Greek Islands. The mixtures are as follows: #1. Cobalt Blue + a touch of White. #2. Mix #1 + White. #3. Mixture #2 + more White. #4. Mostly White with a bit of Cobalt Blue added. Since the light is pouring into the painting from the right the left side of the dome is made darker with Mix #1. 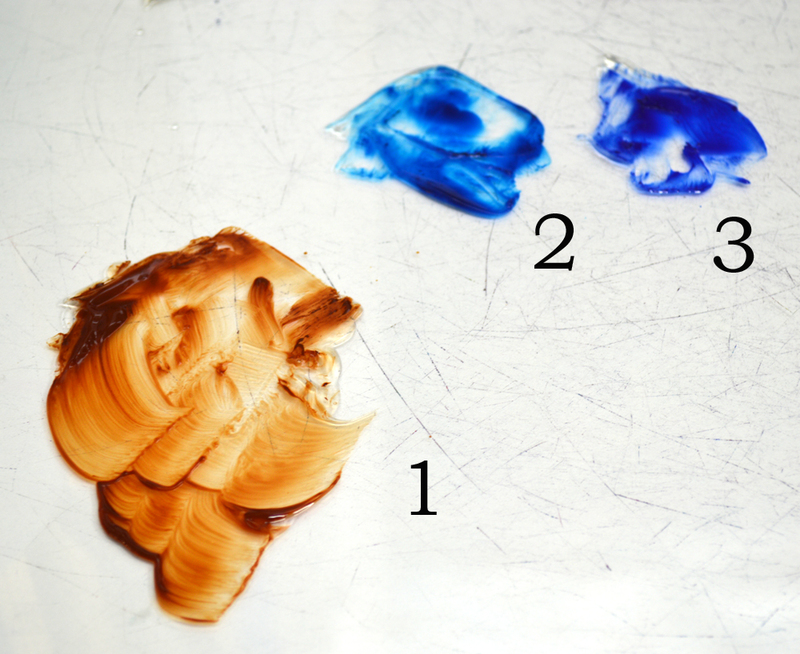 Mixtures #2 and #3 are used for the lighter portion on the right. The highlight made of Mix #4 gives the feeling of roundness to the Cobalt Blue dome. You can click on any of the images to view them larger. After blocking in the white walls of the church I use some of the dome mixes for the latticed windows in the tower. 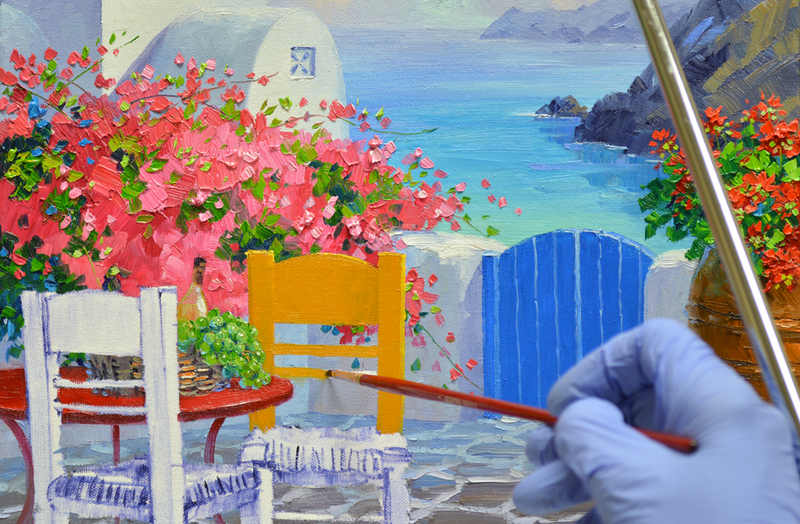 My wrist is braced against a mahl stick to steady my hand as I paint the fine details. 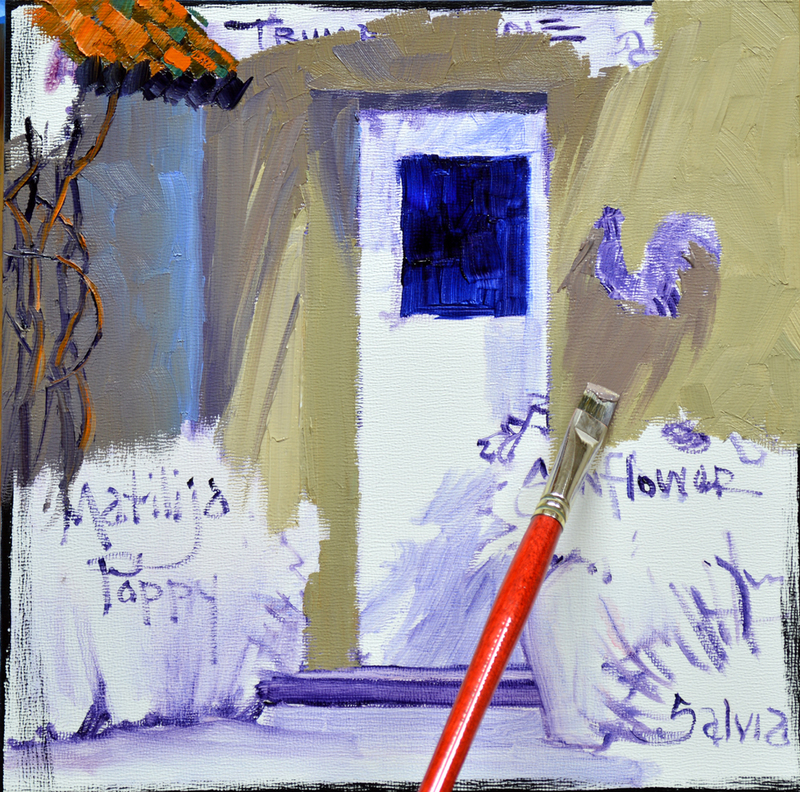 What is a mahl stick? CLICK HERE to find out. 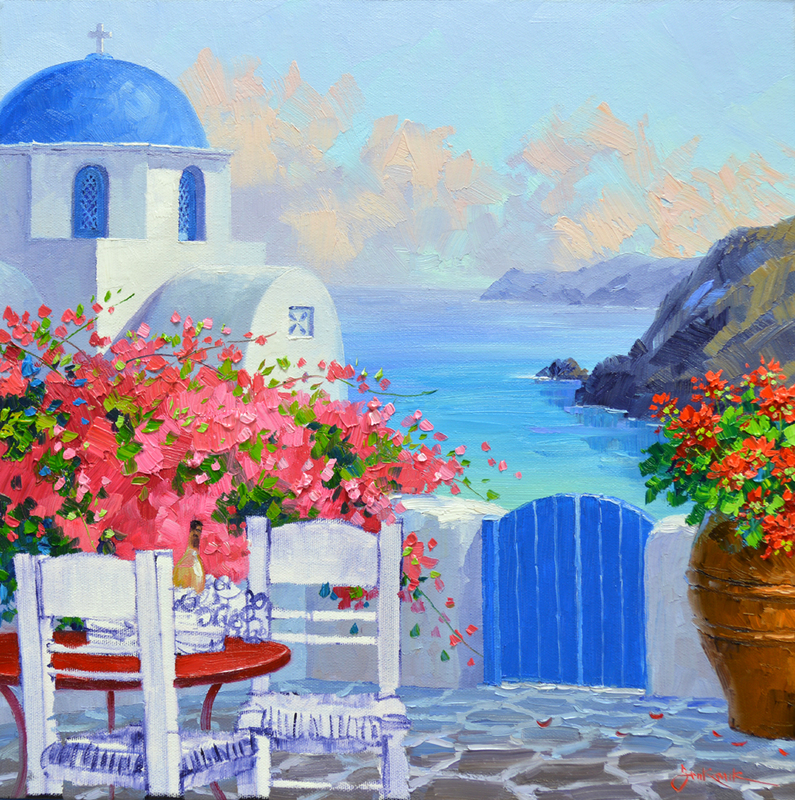 Bougainvilleas are found everywhere in the Greek Isles. This one is made of various combinations in different proportions of Cadmium Red Light + Permanent Rose + White. The mass of colorful bracts are blocked in first. 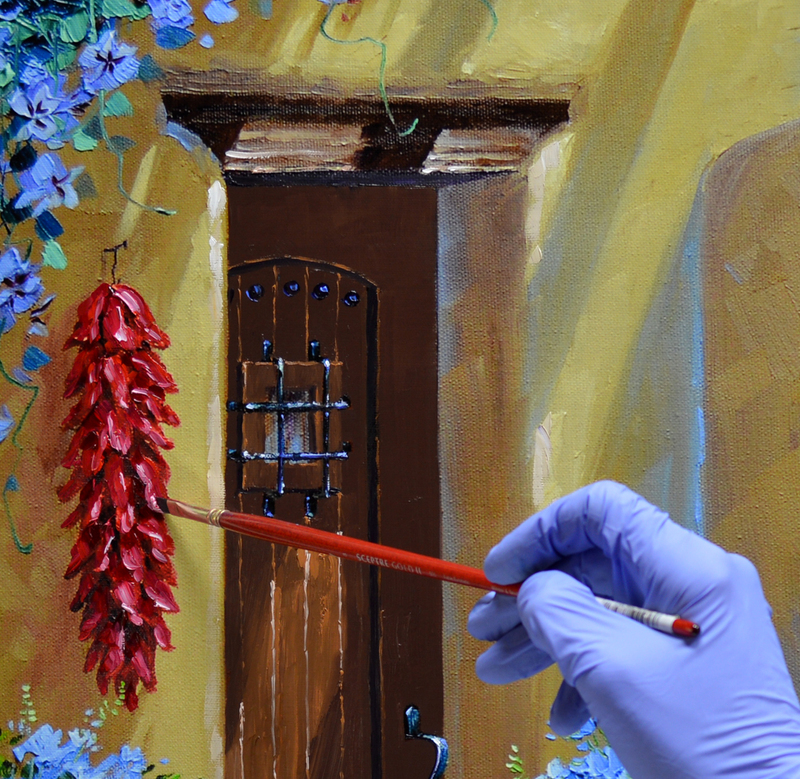 The colored “Blooms” of the Bougainvillea are not the flowers, they are called bracts. The actual tiny white flowers, in the center of the bracts, can hardly be seen. Tired of the winter cold? 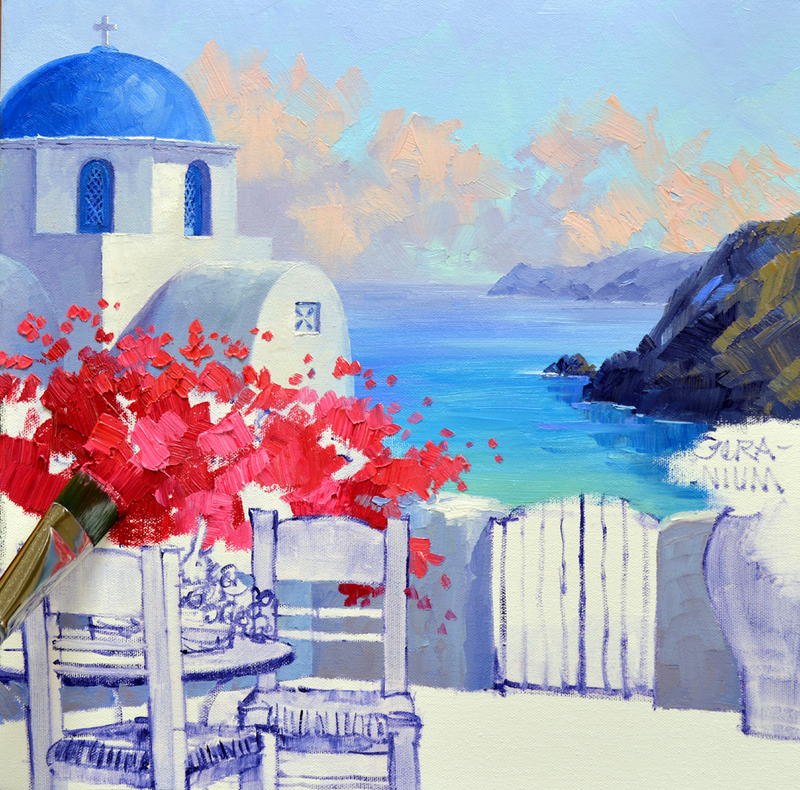 Join me on a magical trip to the warmth of the beautiful island of Santorini for my newest collaboration. The sketch is shown above. 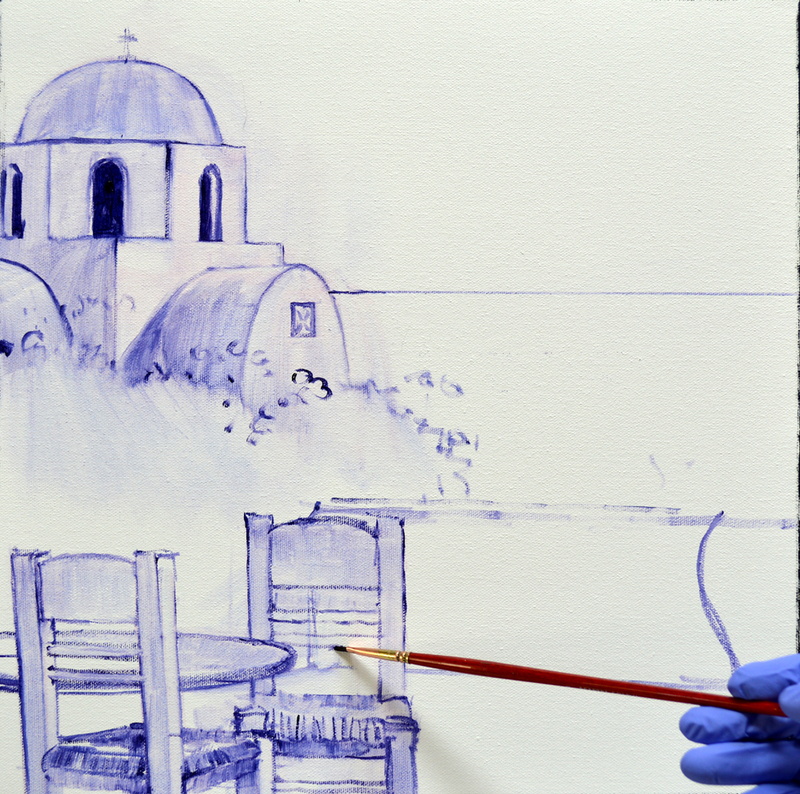 After establishing the horizon line the dome and church are drawn up on the canvas with a brush dipped in a thin oil wash of MUD (Ultramarine Blue + Alizarin Crimson) + Liquin. 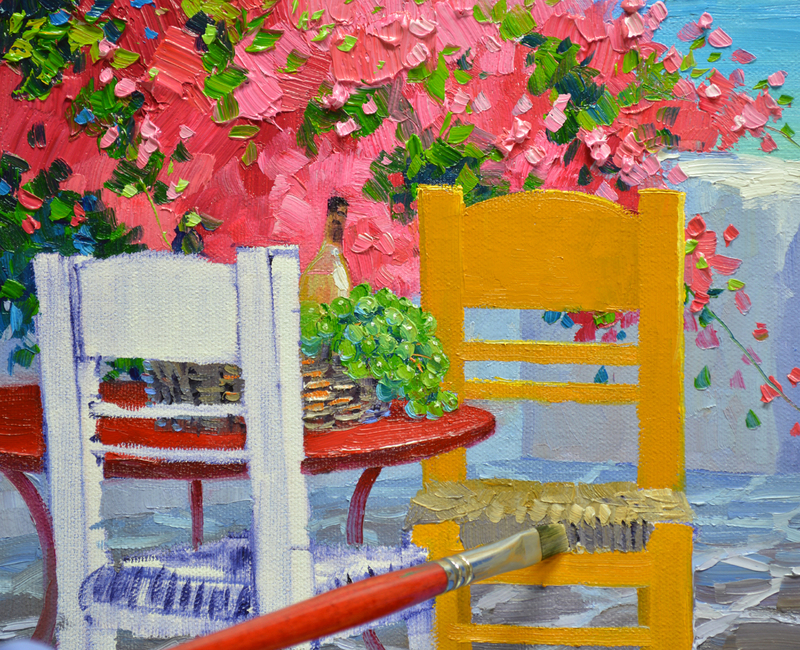 Next the table and chairs on the foreground terrace are added. 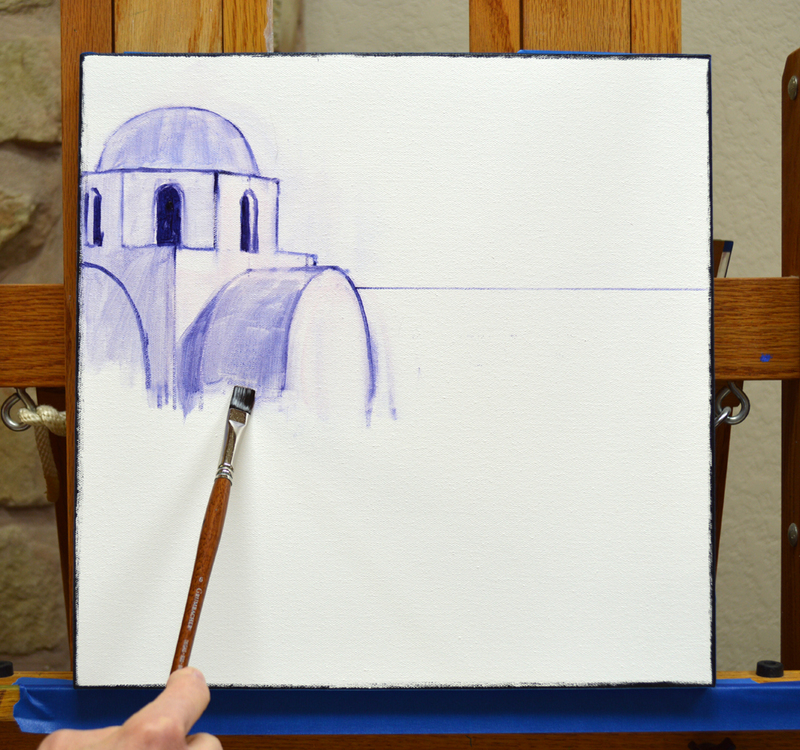 My initial sketch on the canvas is complete, we’re ready to begin painting! I begin with the sky which is the source of light for the piece. Painting forward the distant ocean and bluffs are delineated. The horizon line where the sea meets the sky is softened so it will recede. To see any of the pictures larger just click on the image. Roosters are a fun motif to have around your home. There is an old saying in Provence that a Rooster brings success in the kitchen and happiness in your home! I begin by sketching up my idea for this week’s eBay painting with a thin oil wash of MUD (Ultramarine Blue + Alizarin Crimson) + Liquin. 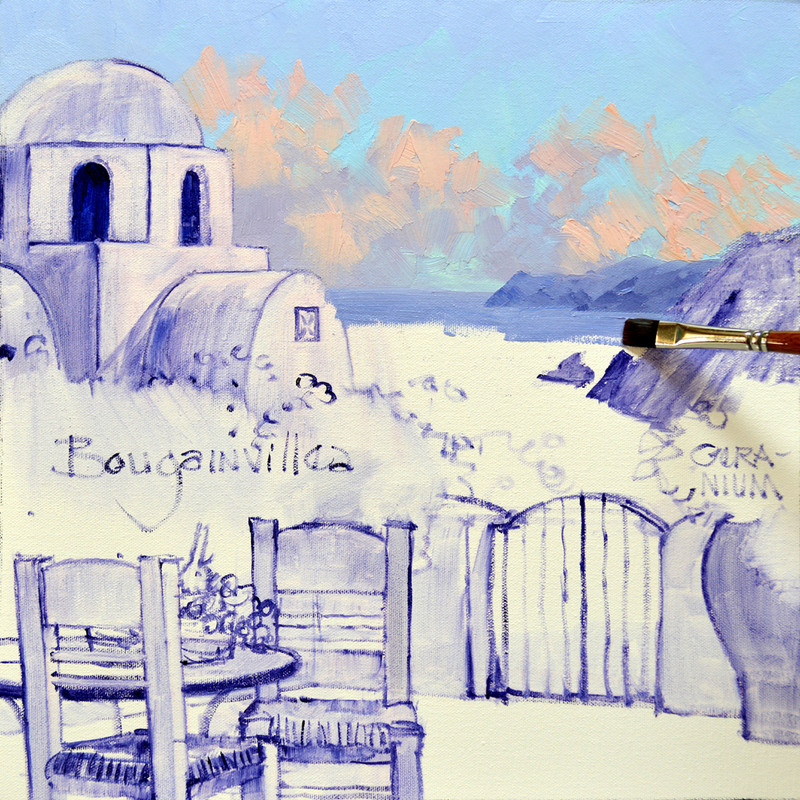 The adobe walls are blocked in with mixes of Cadmium Orange + a tiny touch of Pthalo Blue + White. MUD is added into the mixtures in the shadow areas. The portion of the wall on the left that is nearest the corner is made bluer. The cooler color makes that end fall back. The terra-cotta roof tiles are painted with different proportions of Cadmium Orange + MUD. A little Pthalo Blue is added to the mix, making a muted green that makes the old tile look as if it is covered with moss. 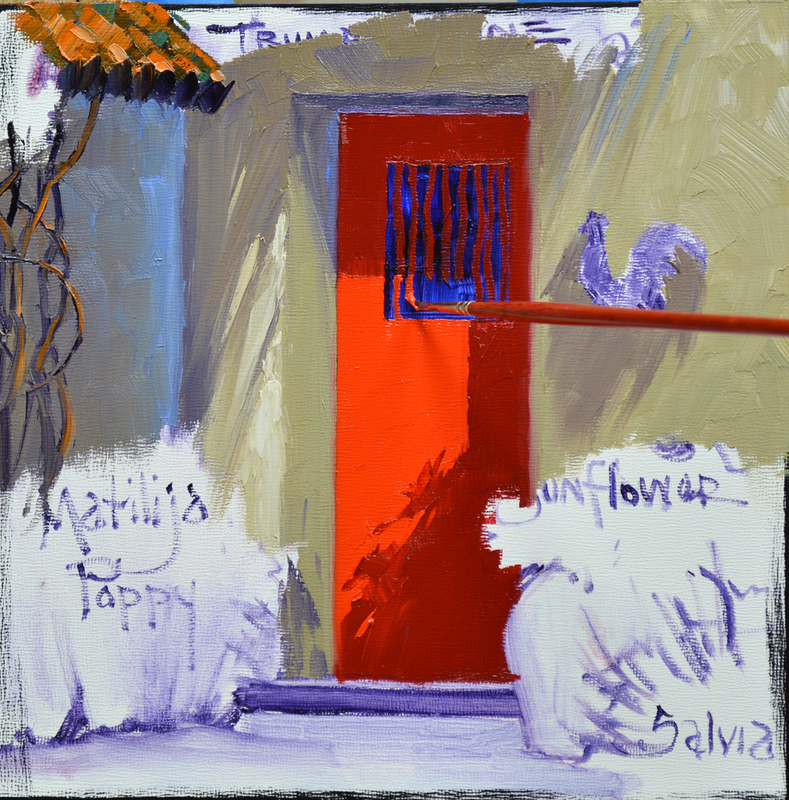 The shadows on the red door are made of Magenta + Cadmium Red Deep. 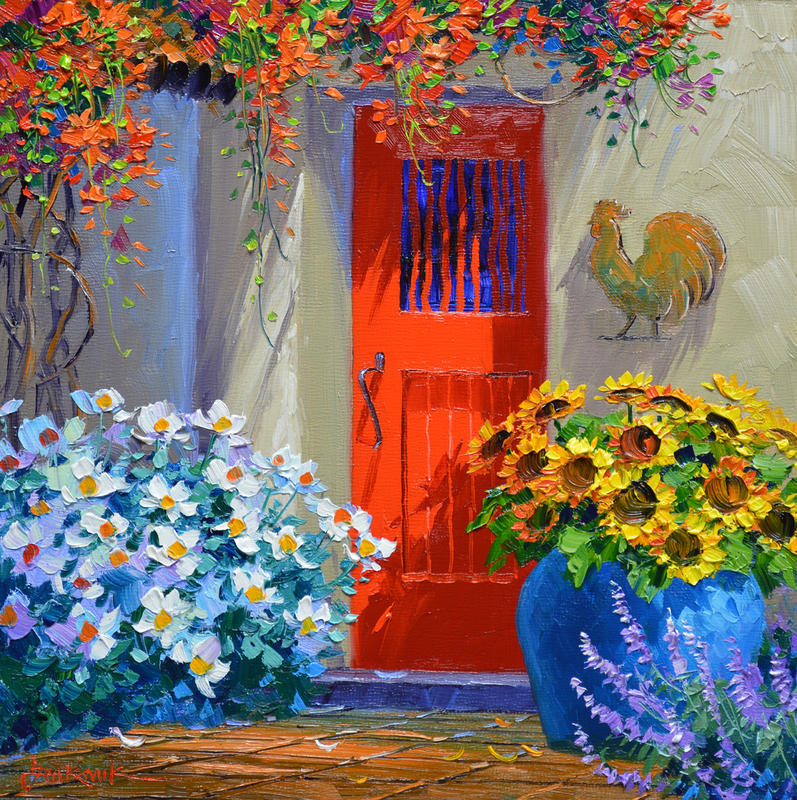 The sunny part of the door is pure Cadmium Red Light. I particular like the willow branches over the window, they add such a neat touch! The floor of the entry is painted with the mixtures leftover from the roof. Using some of those same mixes with a bit of MUD and Pthalo Blue added I begin delineating the bronze rooster. 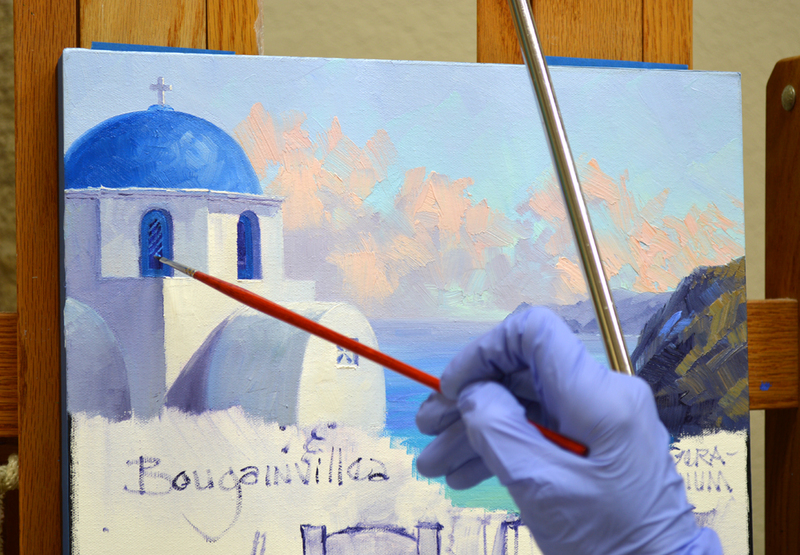 Mixes of Pthalo Blue + Ultramarine Blue + White are used to make the large, ceramic container. 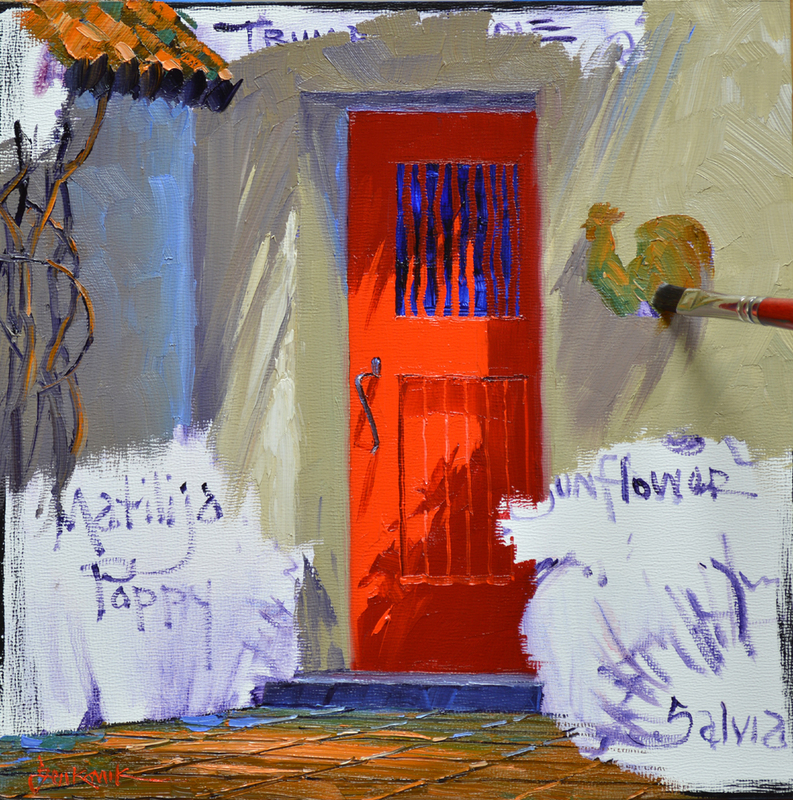 White Matilija Poppies appear so fresh and crisp juxtaposed against the red door. Sunflowers and Salvia finish out the garden lining the walk. People often ask how I come up with ideas for my paintings. Lots of times I just envision a place I’d like to live. 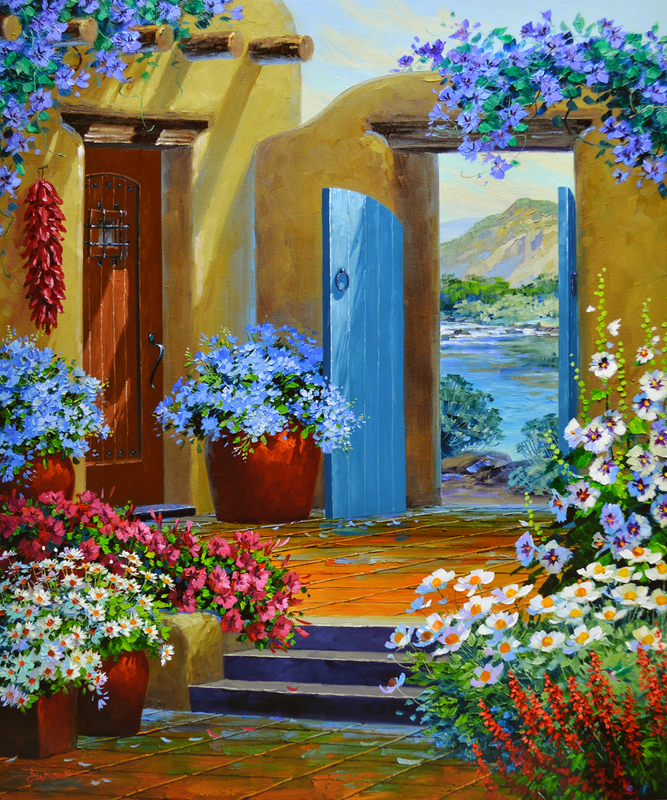 Imagine coming home to this flower filled courtyard after a long day at the office. 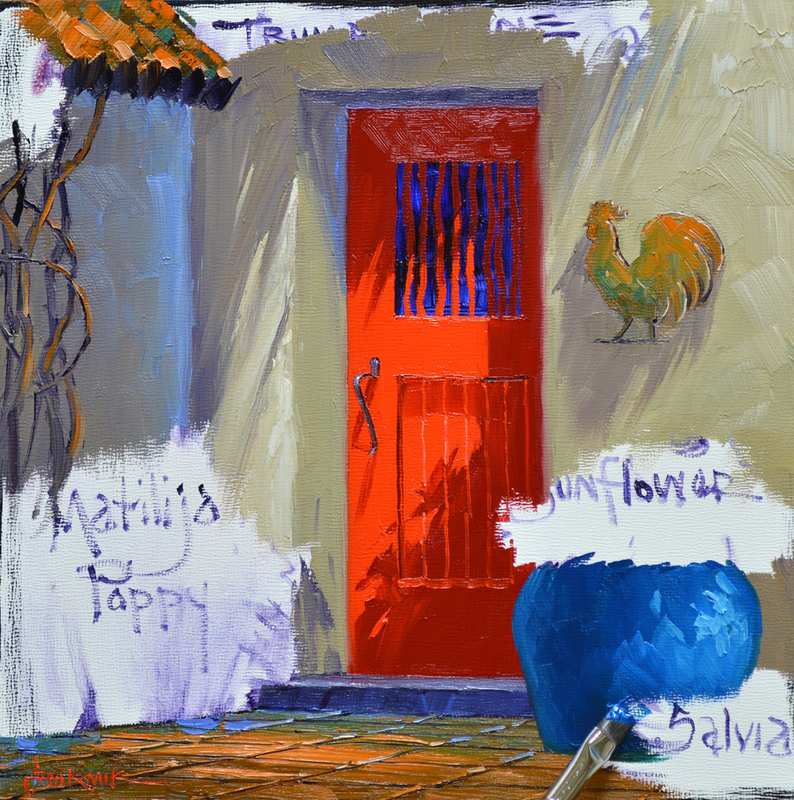 What could be more inviting than the happy little Rooster extending A Cheerful Welcome as you walk up to the bright red door? A Cheerful Welcome would retail in our galleries for $490 but to make it more fun we are starting the bidding on the auction at 1 cent. That’s right, ONLY A PENNY! But you’ll need to act quickly, the auction ends Sunday, March 16 at 8 PM Central Time! To go directly to the eBay auction CLICK HERE. Here’s your opportunity to bring a blaze of color into your life with a larger EMBRYO than I normally list. 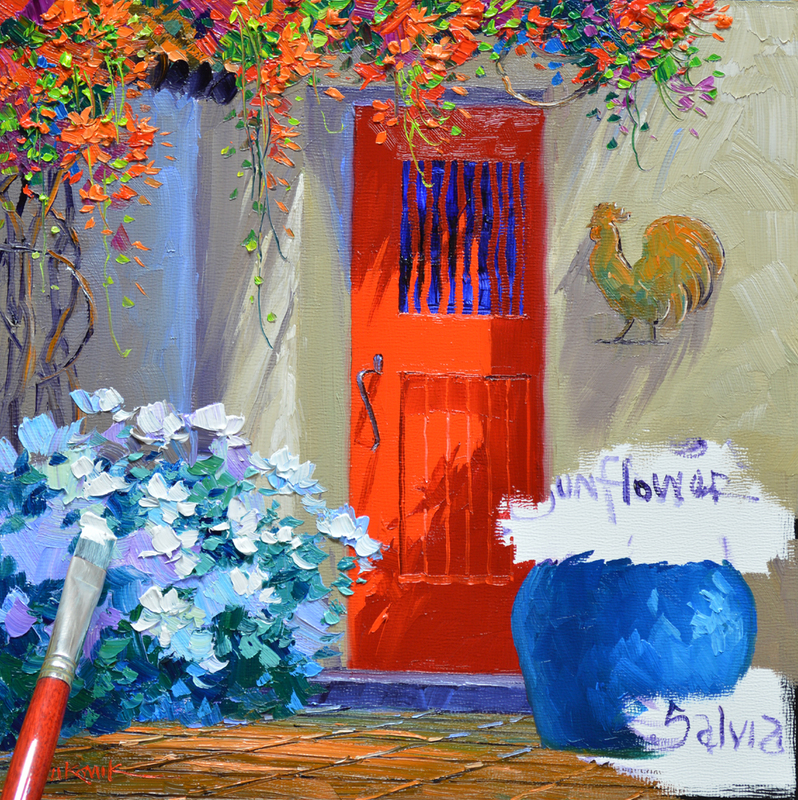 A Cheerful Welcome measures 10″ x 10″. Do you have a gift giving occasion in the near future? Senkarik Original Embyros make unique presents that are sure to please, bringing smiles for years to come. 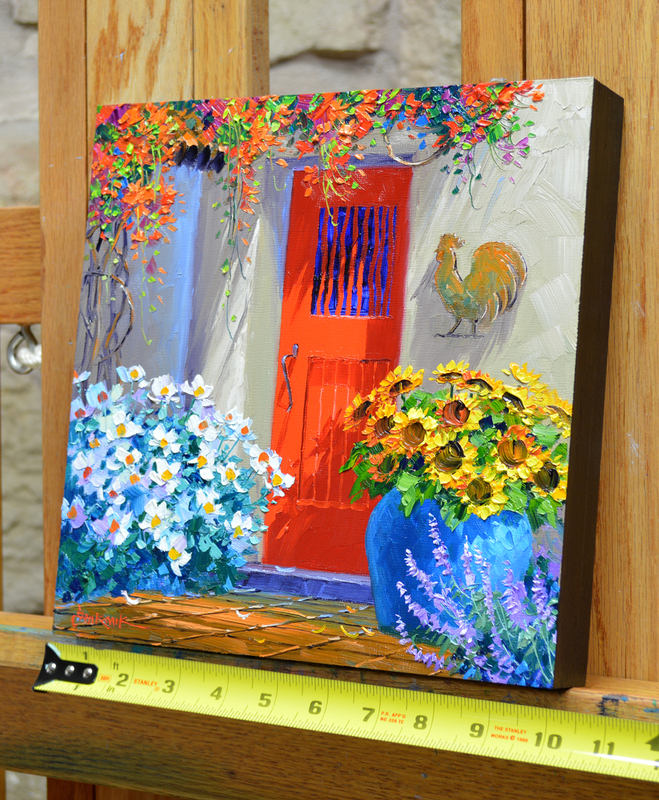 And don’t worry about framing this cheerful rooster, he is painted on a panel with 1 1/2″ finished sides. You can take it out of the box and hang it directly on your wall. We even provide the hanger and nail! Don’t linger, the auction ends Sunday, March 16 at 8 PM Texas (Central) Time.